Several elements came together today to help create a new dish and some interesting pantry and staple techniques. First of all, I had some leftover cranberry sauce from Thanksgiving. I have been a proponent of the cranberry-horseradish combination, yet this morning I took another path, blending dark miso and base cranberry sauce to make cranberry miso. Hello mouth, what have I been missing? By the way our base cranberry sauce consists of cranberries, OJ, salt and agave syrup cooked down to a thick compote. With the cranberry base we can go in many directions from the horseradish addition to the dark miso to the I have not thought of it yet. So, we now have cranberry-miso in our larder. The sweet, salty, tannic and bitter flavors will work great with a number of ingredients, raw and cooked, fish and meat, as a sauce and puree. We have also spent some time revisiting the carrot, most recently in soup, and today as a hot crème caramel enriched with yogurt and balanced with a sweet spice espresso caramel. 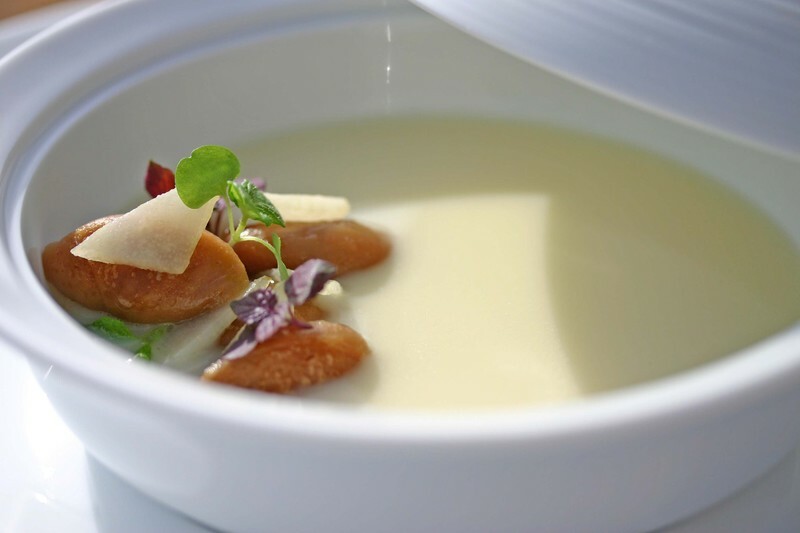 The carrot crème caramel is light, ethereal and equally balanced by the bitter, earthy and aromatic caramel. 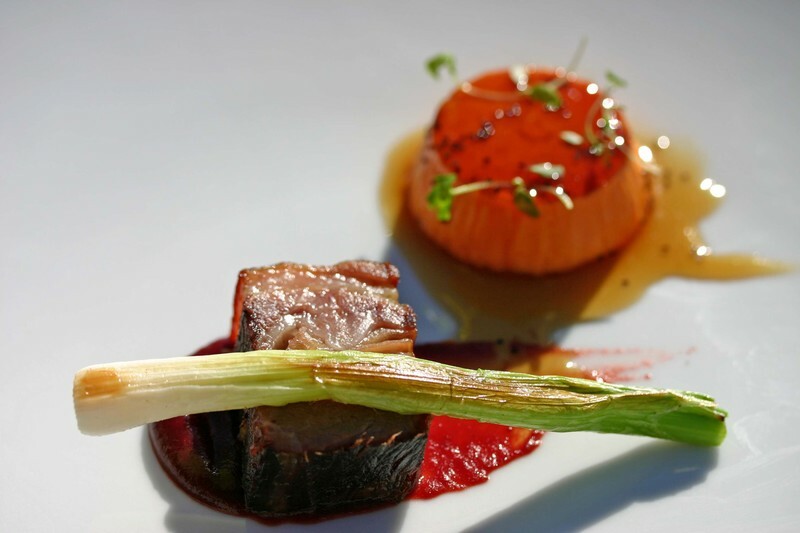 We combined these two products together in a dish featuring griddled lamb belly and green onions. The elements all have distinct flavors and still work to complement each other. 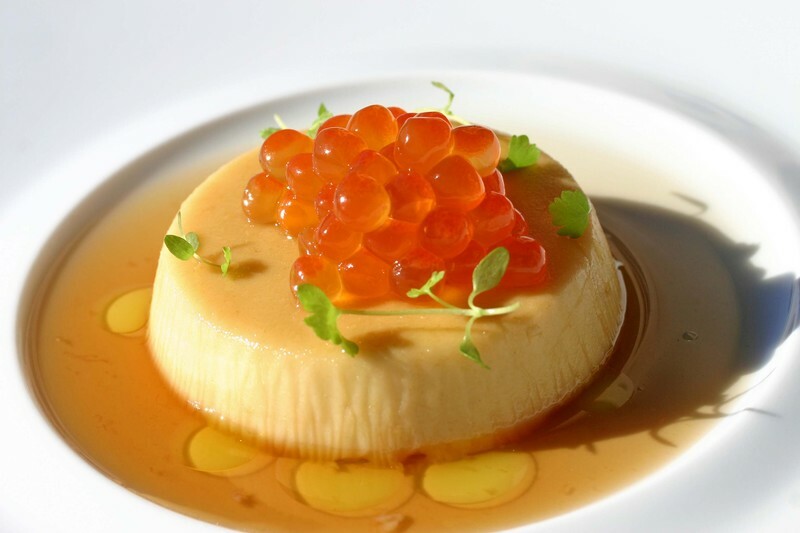 The hot crème caramel has been the subject of several dishes. In today’s dish the crème caramel is brought down in size in order to allow it to be a supporting character and still add an exciting element to a dish. Many ideas are sparked when I am away from the kitchen. This most recent soup came about in the middle of the night, I guess that is why I keep a pen and post it pad on my bedside table. The soup base is simple with just green olive brine, carrots and spring water. Once the carrots are cooked, we puree and strain the soup, adjusting the flavor with a pinch of sugar or salt if necessary. 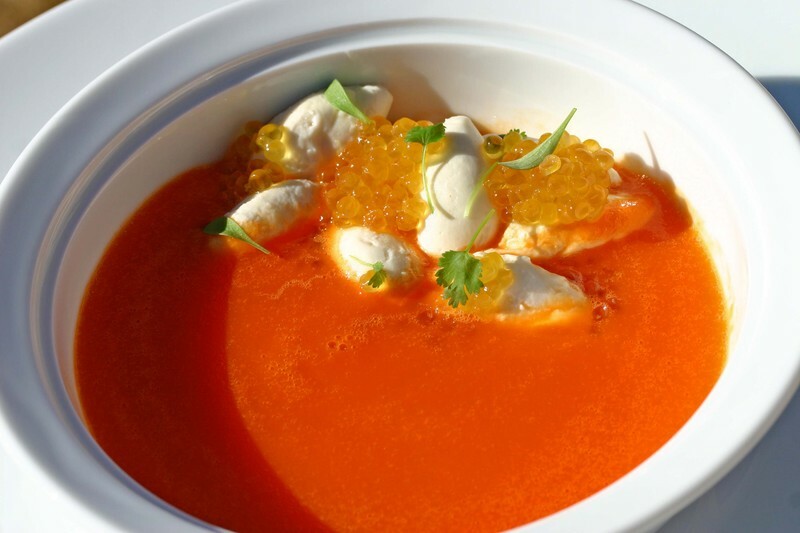 The carrot soup balances the richness of the olive brine to the earthy sweetness of the carrots. We enriched the dish with cauliflower-cream cheese gnocchi. A dollop of decadence comes from the smoked wild char roe and the young cilantro adds an herbal grassy note to punctuate the flavors. 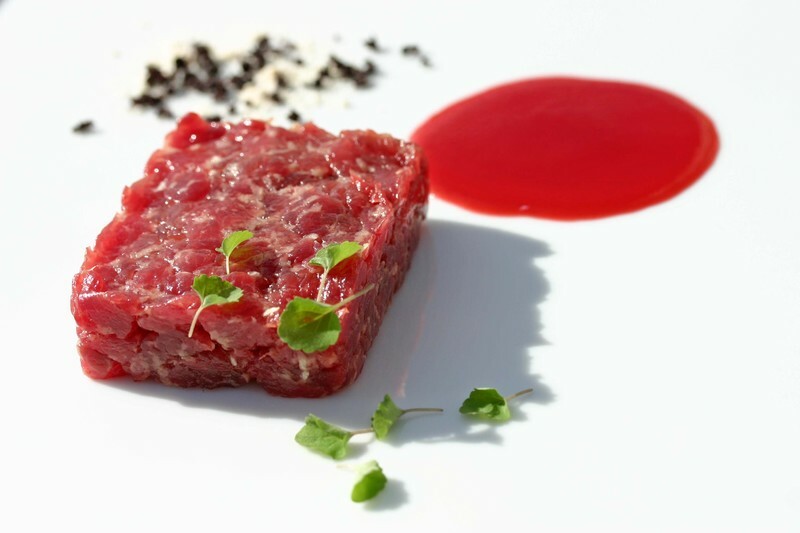 We have some wonderful veal to work with and I wanted to serve some raw as a tartare. I wanted to pair some traditional flavors with the tartare and while Caesar dressing is not a usual pairing, anchovies, lemon and capers are. Sure, capers are not in all Caesar dressings either, but they are in mine so the stretch is not to far. We began the sorbet base with skim milk infused with crushed red peppers, anchovies, garlic powder and salted capers. To the infused milk we added cream cheese and grated sheep milk cheese. (Yes another step outside the boundaries of tradition) A couple dashes of crystal hot sauce rounded out the flavors and all I had to do is wait for the base to freeze. This morning the ice cream was ready for the Paco Jet (our ice cream maker), and the dish was ready for assembly. 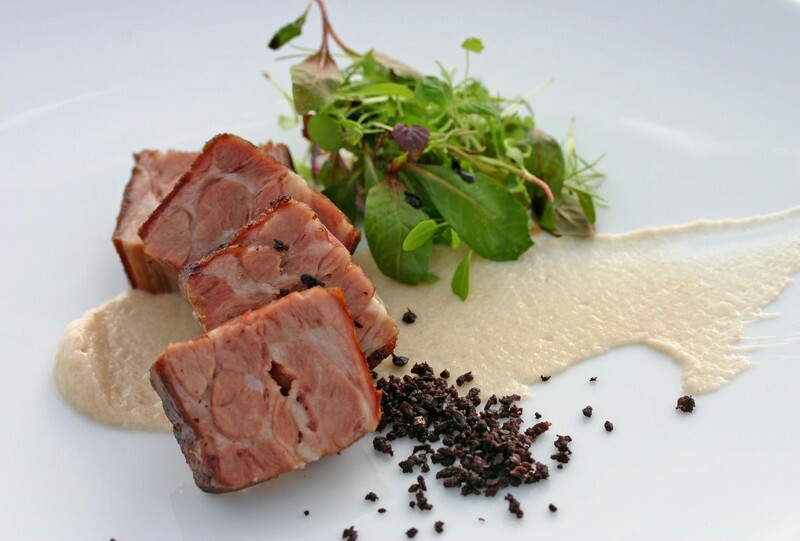 We diced the veal and seasoned it with Armando Manni’s olive oil, young marjoram and fleur de sel. We added some roasted meyer lemon puree to the plate for acidity and some caper-mustard chips for texture and tang. The Caesar sorbet crowns the tartare accented with a couple of marjoram sprigs. 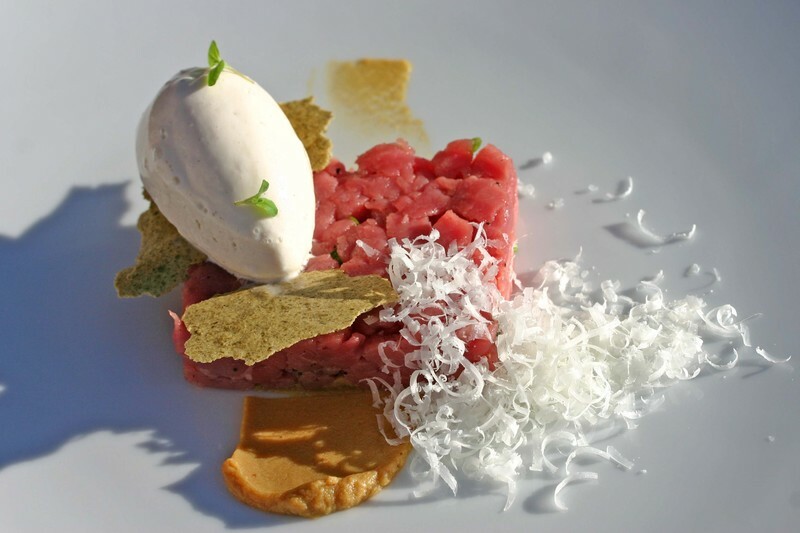 The creamy tangy sorbet accents and rounds out the pristine veal. Dry rubs are common, particularly out here in the southwest, where ribs and Q happily sit upon the food kings throne. I like spices and combinations there of, though I have not been one for dry rubs. And today it dawned on me, there can be more to a rub than chili spices and ribs. I looked immediately to the salad dressing aisle, particular the pre-packaged dressings, the scientific combination of dry ingredients combined to produce the ever popular commercial dressings. And these packages have been used by home cooks to make dips, season potatoes or sprinkle on green beans as a last minute seasoning. Why have I overlooked these basic pre-packaged kitchen staples? Well, because they are pre-packaged. But, think how many millions of dollars have been spent combining flavors in order to create unique and original top secret blends for simple salad dressings and dried soups. Well, we have plenty of unique flavors in dry form in our kitchen from buttermilk to soy sauce. What if we started using these ingredients as dry rubs for fish and meat, mirroring existing flavor profiles but increasing the factor of wow with more intense and focused flavors, make the rubs ingredient specific. Today, Aki put together a ranch dressing dry rub for veal fillet. The powdered base consists of powdered buttermilk, fennel, celery seed, smoked paprika, black pepper, and salt. We rubbed the fillet with the mixture and then slow cooked the fillet for an hour at 52.5 degrees C. We paired the well flavored meat with squash-cocoa agnolotti, melted onions, epazote, and sweet and sour squash juice mixed with pumpkin seed oil. Today's rub is the first for many to come. 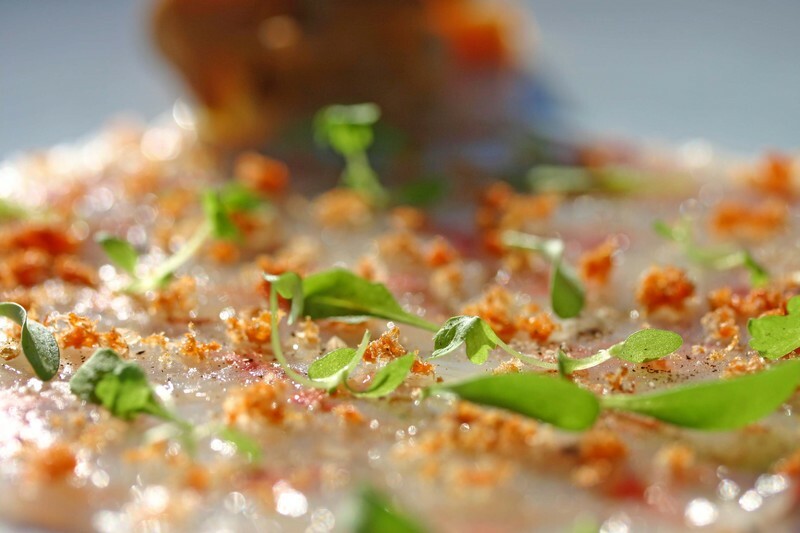 The morning started with some interesting ideas revolving around veal tartar. Unfortunately, the execution of these ideas will take time and in turn will not be useable for this evening’s menu. However, once I got the parts in motion for tomorrow's veal dish, I was able to concentrate on a new approach to poaching fish and other ingredients for that matter. We used the same concept of broth making as we did with our bubble tea. In fact, the broth is merely identical except that today we have added soy sauce since we were not going to be floating roe in it. 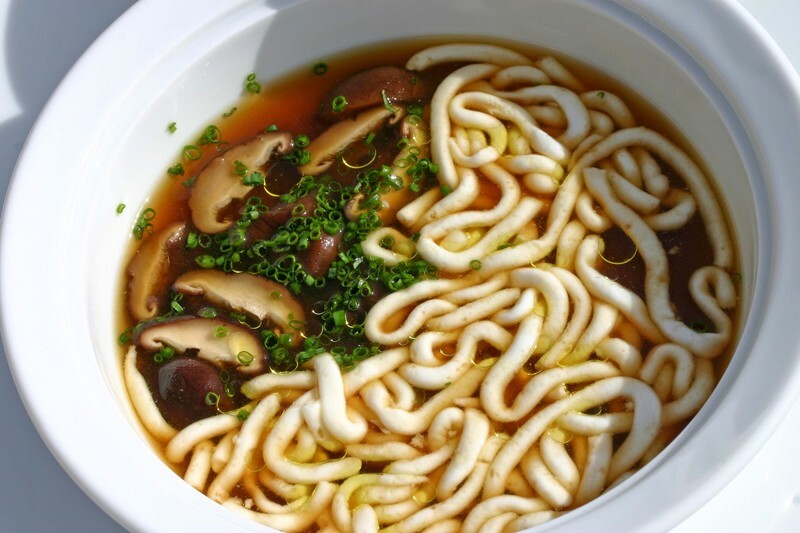 The tea broth, thickened slightly with gellan, plays two roles in the dish. 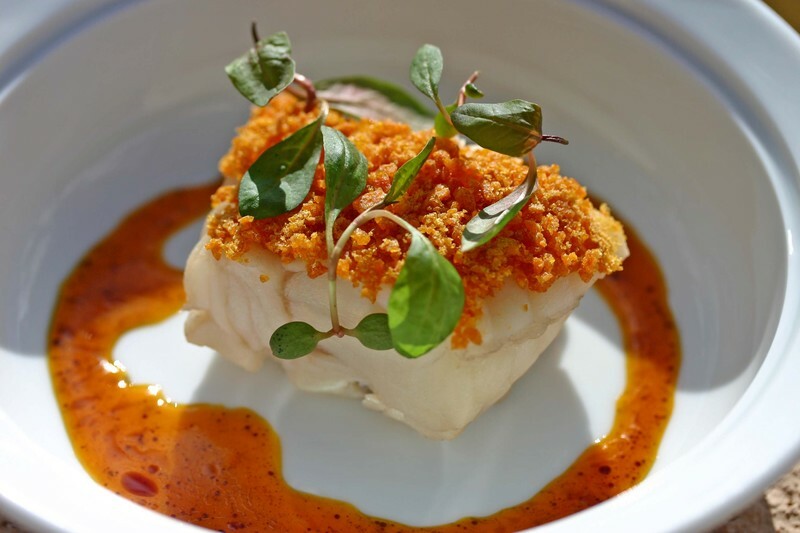 First of all, we are able to poach monkfish, or other proteins for that matter, gently in the broth, and the slight viscosity of the broth helps keep the juices in the fish rather than transferring into the broth. 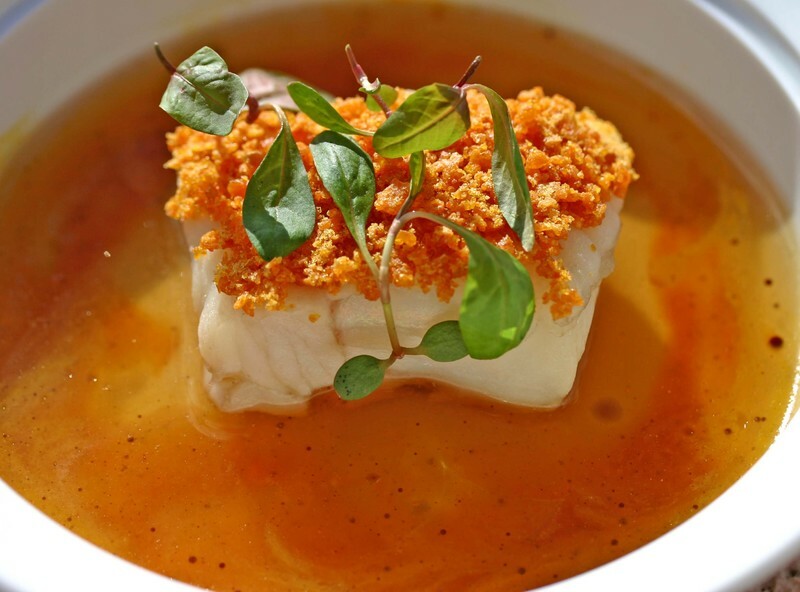 Also, the broth slightly glazes and imparts a delicate flavor to the fish. Secondly, we are able to use the warm tea broth to capture and spread the flavors of our sweet and sour squash juice mixed with pumpkin seed oil. When the warm tea broth is poured around the fish, the squash juice mixes with the tea and the pumpkin seed oil floats in little droplets around the fish rather than pooling on the top of the broth. Pretty neat, and a great way to integrate and still separate flavors. I was looking for a more efficient method of roasting monkfish. Sometimes we get large monkfish tails, sometimes small, and sometimes we get a mixed bag. With our recent mixed bag of monkfish we opted to create a terrine of monkfish, held together with the help of transglutaminase. 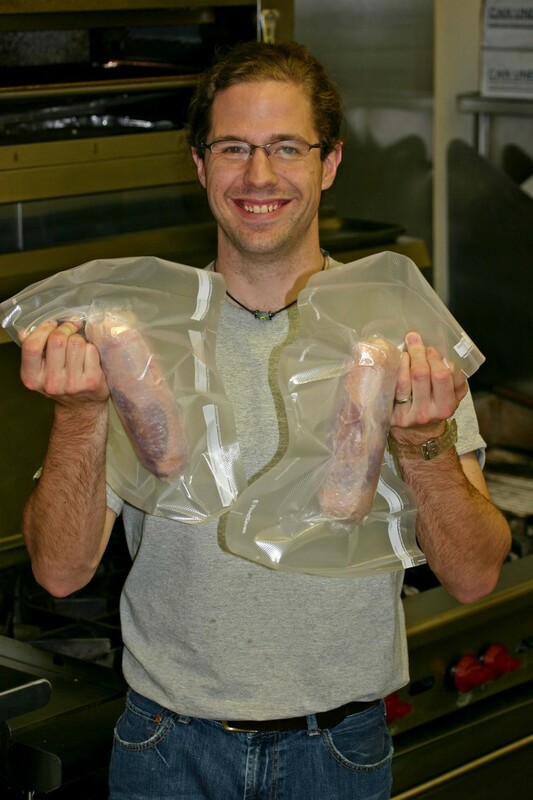 We cleaned up the various sized monkfish tails and bound them together in a terrine mold. Once the tails were linked, we sliced the terrine and were exposed to a monkfish mosaic. We were then able to sear the slices on our griddle and get a uniform cooking and crust on our previously mismatched monkfish tails. We paired the mosaic with grape-chipotle sauce, braised black cabbage, preserved morel mushrooms, grated chorizo and marjoram. I'm a terrible sleeper. I tend to wake up in the middle of the night and lie there for hours trying to will myself back to sleep. Sometimes it works and other times I mull over new recipes to distract myself from the seconds ticking away. The night before Thanksgiving I pondered the pumpkin pie. I worked out a filling for two pies, because as long as you're making one you might as well make two. And because I was pretty sure that one wouldn't be enough (I was right). My filling contained creme fraiche and mascarpone for an element of decadence and a luscious, creamy mouth-feel. I then considered the spices that have become so ubiquitous that they are even sold pre-blended as pumpkin pie spice. Does pumpkin need to be married to cinnamon, nutmeg and cloves to be complete? Not in my book. So I simply eliminated them in order to let the pumpkin stand alone in the spotlight. So, here it is, an incredibly rich, spice-less filling, enough to fill two of your favorite pie shells. By the way, Alex likes a softer crust with this filling so I don't blind bake his, but feel free to do whatever suits your particular fancies before filling your crust. Combine the pumpkin, mascarpone and crème fraiche in a food processor or blender and puree until smooth and well blended. Remove from the blender or processor and place in a large bowl or pitcher. Whisk together the sugars, salt, eggs and rum. Stir the egg mixture into the pumpkin until thoroughly blended. Pour the filling evenly into the two pie crusts and bake for 55-70 minutes until the center is firm and wobbly like Jello. Let cool at room temperature for at least 30 minutes before serving. I've learned some things about serving and entertaining over the years. I've learned that whatever my favorite dish at the table is will be everyone else's favorite too. As someone who loves to eat leftovers late night and for breakfast, this poses some issues for me. My first strategy was to make more of whatever dish I wanted leftovers of. Interestingly, when I made more, people ate more and I still ended up without enough leftovers to satisfy my cravings. This year I set my leftovers aside before serving dinner. Selfish? Perhaps, but the last thing I want to do after serving Thanksgiving to our guests at the Guest House is go home and cook again. Alex is content to devour a plate at the end of service in the kitchen, chatting with Michael. Me, I prefer to go home where I can relax with a glass of wine and my supper. Fortunately I don't need the whole kit and caboodle. A plateful stuffing and a glass of wine is plenty to be thankful about in my book. This particular wine is entirely too young, but still seductive. It is from one of our favorite vineyards and one of our (many) favorite grapes. We couldn't resist opening a bottle tonight although the remainder will be tucked away for a year or five or ten, before seeing the light of day. Don't misunderstand me, it's a lovely sip and goes beautifully with my stuffing. It's just that the taste tonight is just a tantalizing hint of what it will be in it's maturity. For the promise of that experience, we can be patient before opening the next bottle.. Deep purple color with red-violet undertones. Fading only slightly at the rim to highlight the violet purple tones. Super high extraction. Intense nose conjuring wine soaked/stewed prunes and boysenberries. It's jammy and alcoholic. It’s first impression is sharp and slightly hot on the palate. Spicy notes of cinnamon and black pepper come through next, then dark berry fruits, cedar and spruce The wine itself is medium bodied and lively on the palate with medium high tannins and assertive acidity. It evokes the creamy richness and depth of dates and their smooth, chocolaty undertones, the floral heat of guinea pepper and the astringent sweetness of black olives. It possesses a lingering finish of menthol and blackberries. It continues to evolve in the glass but will definitely bloom after several years in the bottle. Thanksgiving can and has been a pain in the arse. You end up jumping through hoops trying to make everything crantastic, exotic and mind blowing. How can the stuffing usurp the previous years, what cartwheels can we do with the turkey, how many artisanal ingredients can we weave together to fabricate the fine cloth of an ideal Thanksgiving? The answer is actually quite individualistic, but at the end of the day Thanksgiving is about giving thanks and enjoying the time with those around you. And that is what we forget. The holiday centered around food usually comes to a crashing halt when the dishes pile up or the exotic pumpkin pie does not set or the heritage bird does not arrive in time to roast it. This year we took the time to care about the seemingly ordinary ingredients and it truly paid off. Sure, we took the time to making a turkey roulade, yet that allowed us to roast a whole turkey in less than an hour. 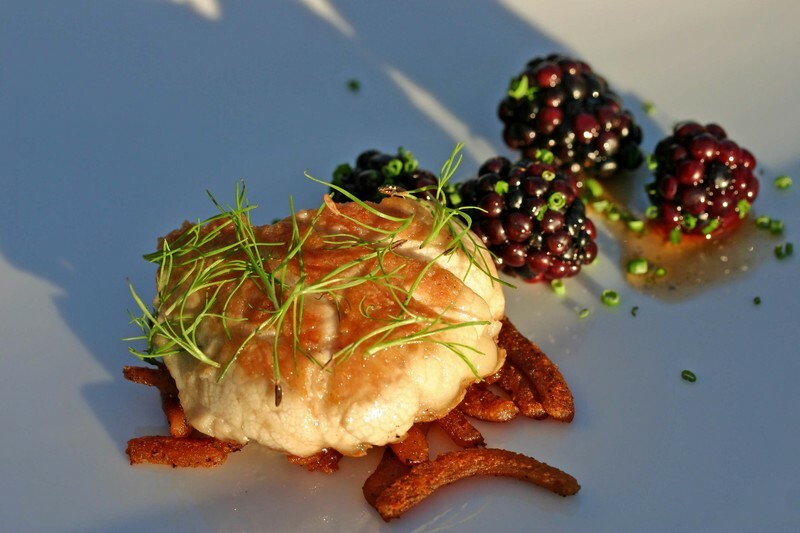 We used cranberries and horseradish, button mushrooms and sweet potatoes. Even our pumpkin pie was made without pie spices. And what is great is our guests tasted the difference. They were not overwhelmed with the complexities of the food, rather they were overwhelmed with the incredible tastes of the ordinary. Amidst the clamor and commotion of getting ready for Thanksgiving, actually it has been quite organized; Aki took the time to satiate a craving—Rice Krispies Treats. 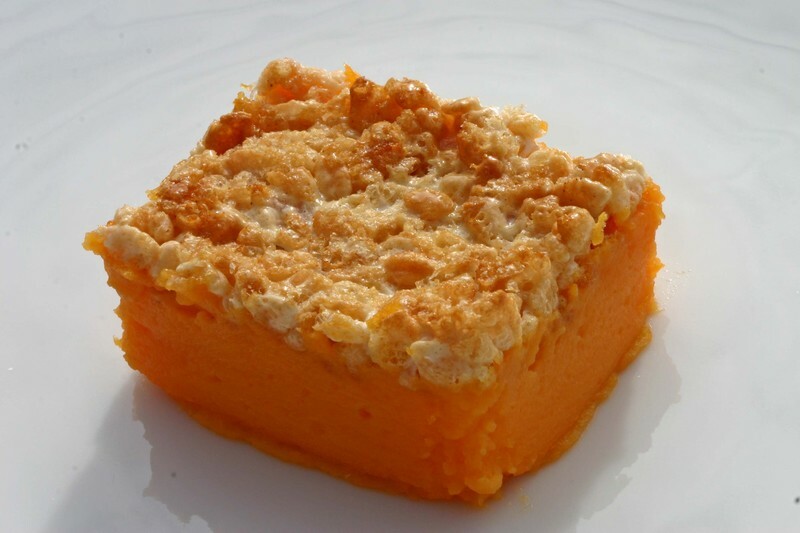 As I was out on the walk I was thinking about the treats, our smoker and came up with the idea of rice krispies treat crusted sweet potatoes instead of the traditional marshmallow topping. Since Aki had already made the treats with other intentions, I was unable to put them in the smoker, though I will, maybe even tomorrow. Instead, I settled with the compromise of sweet potatoes crusted with the original rice krispies treats. And, come to think of it, the treats are not quite traditional either . Aki oven roasted the marshmallows and butter instead of the normal stove top melting method. I browned the 3 tablespoons of butter in a non-stick pan and then added the 10-ounce bag of marshmallows. These roasted in a 350 oven until they were puffed and golden brown. They then slid easily out of the pan into a waiting bowl with 6 cups of rice krispies. Everything was quickly folded together and pressed into an 8-inch square pan, covered with plastic wrap and left to cool. Since the marshmallows never melted directly onto any surfaces, clean-up was easy and there was an added bonus of the light texture of the roasted marshmallows and the caramelized flavor of the brown butter. These treats were exceptionally chewy and delicious, even without the sweet potatoes. 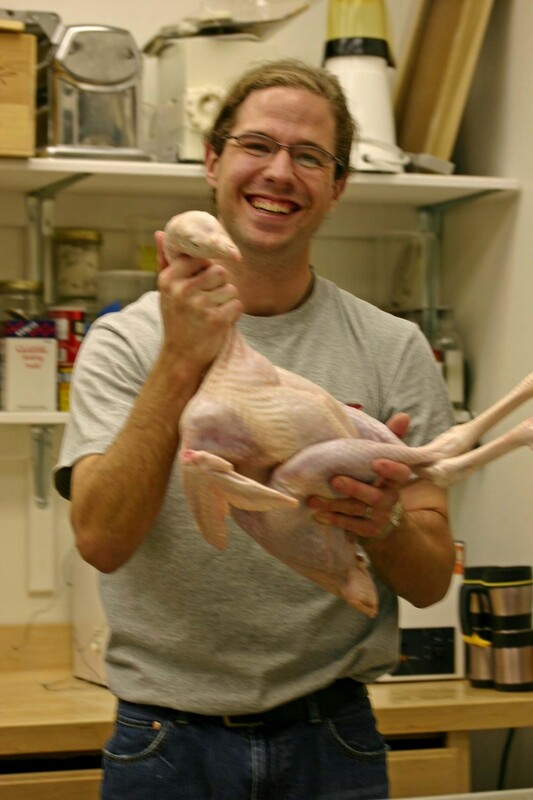 We have been asked on numerous occasions what we do with turkey for Thanksgiving. Well, first we start with a Turkey, and when it is all done we slow cook the roulades for forty five minutes at 67 degrees C then we brown the skin in the oven. The step by step, all forty of them are in the Turkey photo album. Enjoy!!! We have not used our juicer for awhile. I am not sure why, I guess we have been caught up with other things. Well, we pulled it out today. I had some butternut squash on hand and decided they would be a fine victim for the juicer. The juice was vibrant and frothy, barely sweet with earthy undertones. I decided to slowly reduce the juice to a more intense and viscous consistency. As it reduced, I added some rice vinegar to balance the increasing sweetness. 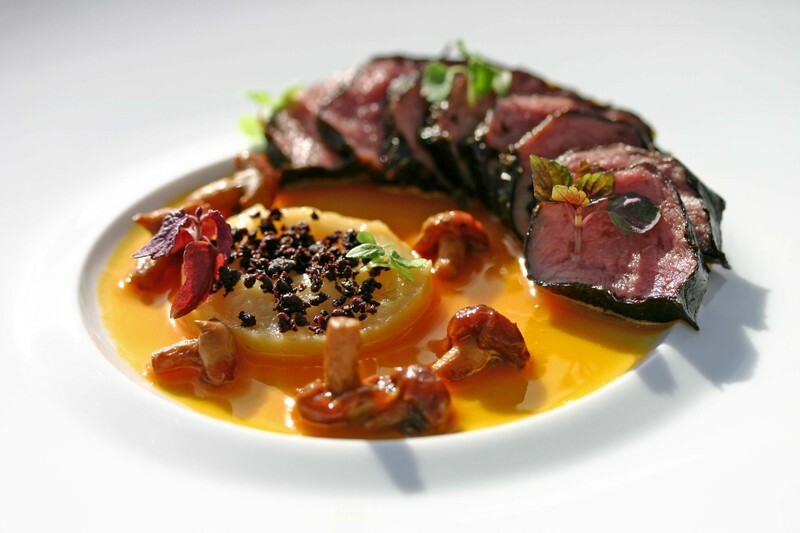 Today we used the juice straight as a sauce for slow cooked antelope with smoked banana-horseradish pudding, ground olives, cinnamon cap mushrooms and young shiso. However, after using the sweet and sour juice I can see many other uses from Thai to pie spiced and from cocktail to broth. Today was the first step. Aki made some incredible broccoli and cheddar cheese soup for our recent guests. In fact, as I type I am drinking an enormous mug of it. Anyway, one key to her simple soup was that she used the broccoli blanching liquid as the soup base. Sounds simple enough, yet in most cases that water ends up down the drain. Following her frugal ways, I made smoked zucchini soup. I melted some onions in a pan and then added the green exterior of the zucchini to sauté and just cook through. The center core of the zucchini I set aside and smoked for about twenty minutes over cherry wood. While the zucchini core smoked, I cooked and then chilled the vibrant green zucchini and melted onions. The pot had some residual onion fond which I deglazed with water and then added the briefly smoked zucchini cores. I brought the liquid to a boil, let in infuse for twenty minutes then strained and chilled it. When both components of the soup were ice cold, I pureed them together and strained the finished product, smoked zucchini soup. 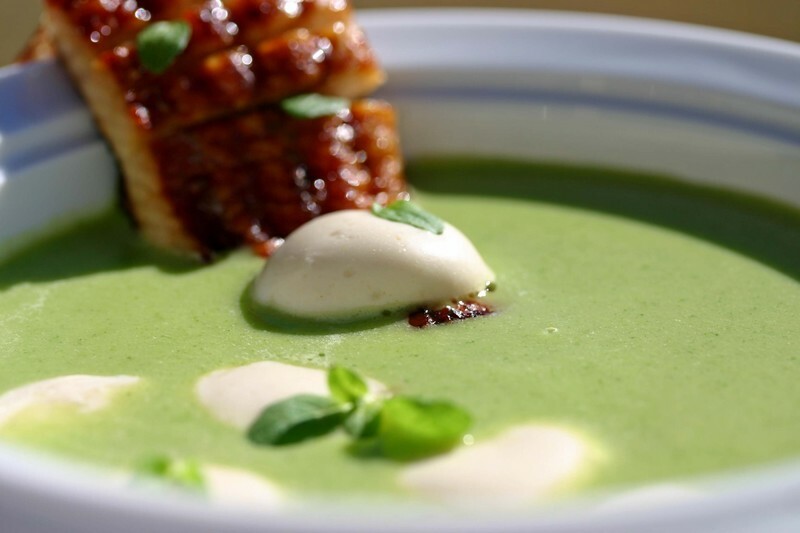 We arranged the soup with roast Meyer lemon-yogurt gnocchi, young marjoram and maple lacquered Japanese eel. 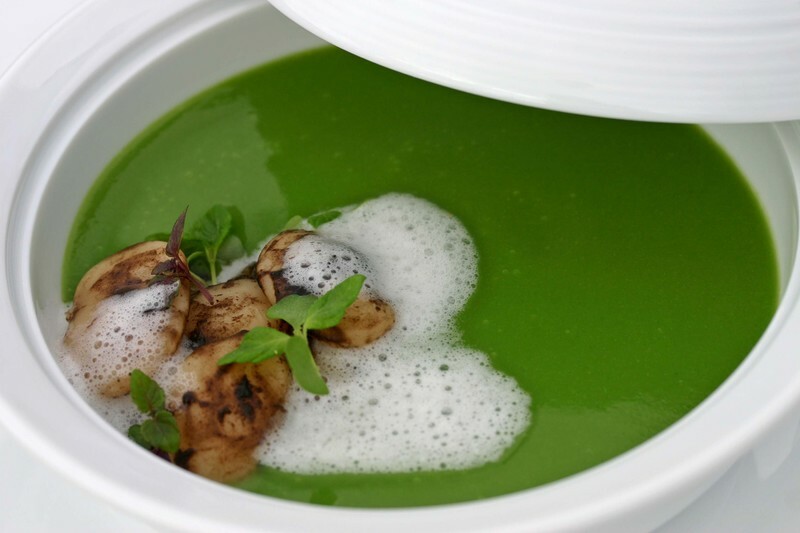 The result of the soup reiterates the idea of using what is normally discarded in a new way in order to integrate tastes and flavors into dishes. 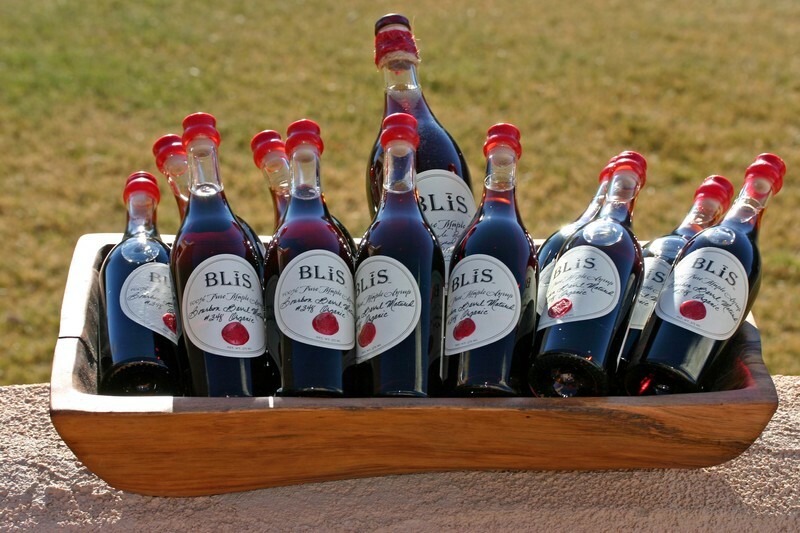 Yesterday we received our shipment of small bottles of maple syrup from Steve Stallard of Blis Caviar. Our original idea was to allow guests to purchase the incredible syrup as a parting take away after visiting with us. When the syrup showed up on our doorstep, I eagerly opened the box and noticed maple syrup on each of the bottles. Oh well, part of shipping to high altitude. I washed the bottles off, let them dry and went home, apparently not knowing how to count. I spoke with Steve about the sticky bottles and he said Merry Christmas. I was flabbergasted and quite appreciative of the gesture. As Steve's generous nature sank in I began mulling the idea of free. We could now do what we chose with these Twelve bottles of maple syrup--turns out when I showed up this morning it was eleven, one bottle did break, I just cannot count. I wanted to do something different with the syrup. He gave it away sincerely and without hesitation. So, who do we give the syrup to? And thus an idea sparked. We have a concept, a culinary progression based on techniques, cooking methods, mediums and ingredients. 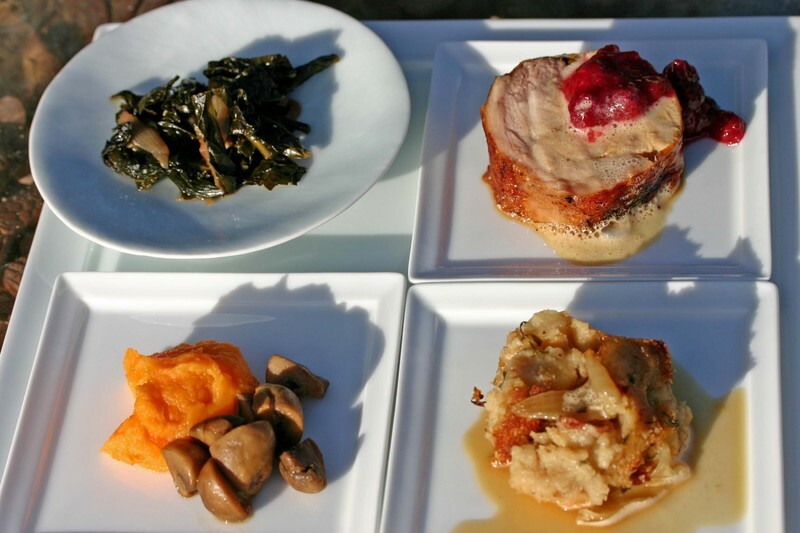 This progression, in our mind, creates a spectacular meal. So, we are putting out the challenge: come up with a dish from any or all categories in the menu featuring maple in some form. The dish does not have to be a polished recipe, though it can be. 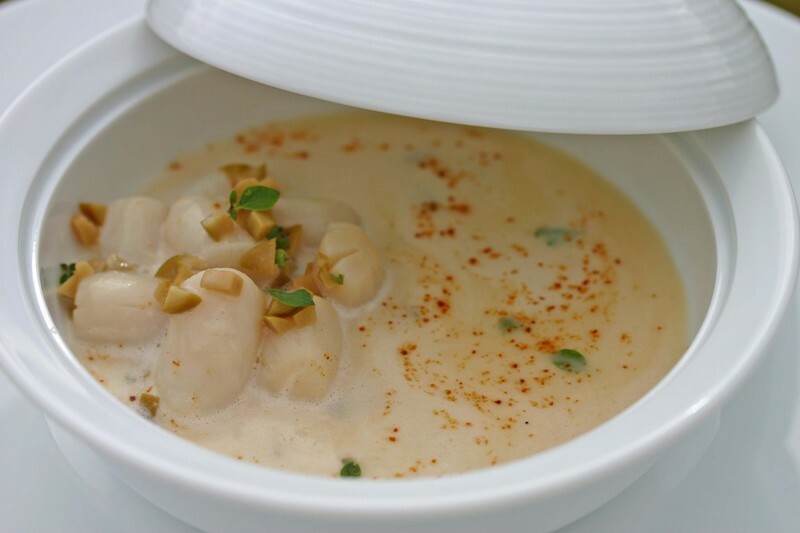 The dish may be a process and compilation of flavors, that is how many of our dishes come to light. Pictures of finished dishes are not required, though as you may realize, greatly appreciated for they help tell the story. The categories for the dishes are numbered, and in one instance, 12 and 12a, we are asking for two dishes. Feel free to walk your own path. We are accepting ideas from today until Midnight on December 12. For each submission, please include what course the dish is for, the complete list of ingredients, a process and or measurements, and a valid e-mail address so we can contact you if we choose you as the winner. The more fleshed out and defined the dish is the better it can be portrayed to Aki and myself. Starting on December 13, we will announce a winner a day until Christmas. While this is not the true twelve days of Christmas, it is a fun way to lead up to the day. The prize for each each course will be a 375ml bottle of Whiskey Barrel aged maple syrup mailed to each winner on us. Our favorite overall recipe will receive the 750ml bottle, you have to have favorites. If you live outside the continental U.S. please feel to submit ideas and we can work out the shipping if you win. The winners will be chosen by Aki and myself and on Christmas day the complete menu will be published, paying tribute to each individual winner. Anyone can enter this contest: professional, non-professional, semi-professional and more. We look forward to your ideas and the creation of an incredible Maple Menu. Again, email these dishes to us via this website. Thanks, good luck, and remember ideas are free. 1)Amuse Bouche/ Amuse Gueule, a small bite to open the palate. 2)Raw and Marinated, usually chilled and can feature anything from vegetables to meats to seafood. 3)Just Warmed, barely cooked in any medium you choose. One of the nice things about working for someone who loves wine is that occasionally we get to try wines that we might not otherwise have access to. Some time ago, Alan was cleaning out his wine cellar up at the house and he gave us an assortment of older bottles that he felt needed to be drunk relatively quickly. All of them were over twenty years old and their condition ranged from clearly over the hill to still relatively vibrant and drinking well. Cleaning out our wine closet today we came across what must be the last of these bottles, one we didn’t realize that we still had. It is the 1978 Domaine Comte Georges de Vogüé, Musigny, Cuvée Vielles Vignes and we decided to open it this evening. The wine is approximately 27 years old and has been in our back hallway for well over a year so we didn’t get our hopes up. The foil cover came away from the cork grudgingly and the cork itself was black with age, sediment and mold. We wiped the cork and carefully eased it out of the bottle. A quick sniff reassured me that it wasn’t corked and we slowly decanted the wine. About two thirds of the way into the bottle the sediment swirled into view and we chose to work with what we had decanted and the leave the rest in the bottle. The wine itself was surprisingly vibrant, it’s color that of only slightly faded red roses, slightly translucent but still with good extraction. There was some fading from the core to the clear rim but it did not have the light orange hues that I was expecting. The nose was earthy and ethereal with a hint of barnyards and roses. The wine itself was surprisingly acidic with a strong backbone holding up it’s delicate flavors. The tannins were soft but definitely still present and the flavors displayed roses, raspberries, newly turned earth and the faintest whiff of cigar smoke. The finish lingered with the dusty flavors of brambles and dried rose potpourri. The wine itself was surprising in both its structure and its flavors, an unexpected boon for a chilly autumn evening. This past week the stools in our kitchen got a workout. It was a pleasure to see them used as we had originally envisioned and our guests took several meals in the kitchen with us, chatting at the counter while we cooked. They were a lively couple and we had a lot of fun with them, discussing everything from food to art, decorating to personal histories and politics. Politics didn't last long as Alex has a strict rule forbidding politics and religion in the kitchen. It's a rule that I agree with for both topics stir up strong feelings and civilized coversations can quickly turn into something you don't want in the atmosphere while you are preparing food meant to nourish the now feuding parties. The stools were a purchase we made when we realized how often people ended up in our kitchen. In retrospect it made perfect sense, after all that's usually the most popular room (in our experiences) when entertaining at home. People feel comfortable there and free to be social and ask questions. They love to watch the process of creating a dish and if you happen to be in the kitchen at the right moment, tasting something new is an added benefit. It's wonderful for us because we learn so much there and having new people to talk to just adds to the whole process. Their personal experiences and biases, their stories about food and their questions about how we do things forces us to look at our own processes in a different way and from a fresh perspective. This website does that for us too. Every question and every comment helps us learn something new. It's a fabulous and sometimes challenging experience. Actually, while I'm thinking about it I'd like to address something. We often talk about how we came up with a dish and the elements that comprise it, but we don't give you actual proportions, ingredients or specific techniques. We don't do that to make people crazy, we do it because a lot of the ingredients that we use are not easily available. Things like Gellan or transglutaminase, Micryo or thermoreversible gels are not found in all kitchens and are available in many different proprietary names, formulas and concentrations. Add to that the fact that neither of is is very good at writing down exactly what we're doing while we're doing it; okay, he's better at than I am, I've lost more recipes than I can count; and you have an imperfect process. We're getting better at recording things and the website has truly helped that process. But we're not willing to publish a flawed procedure or a recipe where we're not sure we (I) remembered all of the ingredients. It actually took a lecture from another chef to get us to start weighing and measuring and writng things down. So we're not trying to keep secrets, per se, but sometimes it would make our posts too long and complicated to spell out each individual recipe and technique. In some cases the fact that most readers can't get their hands on the necessary ingredients is another deterrent to publishing the procedures here. We are trying to get more informatin out there and if you have questions please feel free to e-mail us or just leave a comment. Speaking of answers, I promised someone a recipe for scones. Well, actually I promised a few people, I thought that I had posted it already but obvously I was mistaken. So here goes, this is one of those basic recipes with endless permutations. 1 teaspoon flavored extract if desired (vanilla, lemon, almond, etc. In a food processor pulse together flours, sugar, baking soda, baking powder, salt and optional lemon zest. Add cold, diced butter and pulse to blend. Add liquid and extract and pulse till the dough just comes together, It will still seem a bit crumbly. Turn the dough out on to the counter and using a bench scraper, fold in the fruit or nuts of your choice. Form the dough into two 6-inch rounds, approximately 1 1/2 inches high. Cut each into quarters or sixths depending on what size you like your scones. Lay scones out on a parchment lined baking sheet. Bake 7 minutes and rotate the pan halfway. Bake 7-9 minutes more or until golden brown. Let cool on the pan for five minutes before serving. *For vegan scones, substitute 4 ounces chilled nut butter for the cold diced butter and 1 cup soy or rice milk for the liquid. 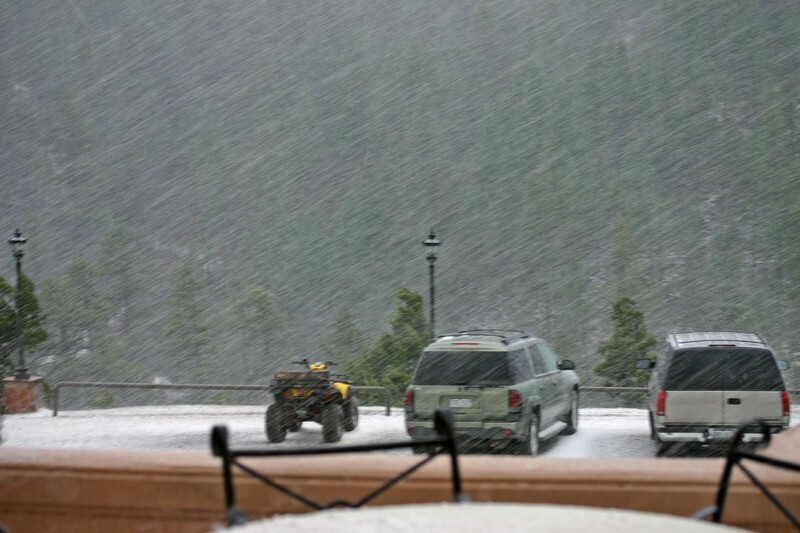 Our driveway at home is a turn off of a dirt road that leads into the San Juan National Forest. One of the strangest, seemingly normal for Pagosa, things that I have seen out here is people who use cars or trucks to walk their dogs. They drive down Turkey Springs Road at 5-10 miles an hour while one, two or even three dogs run alongside the cars. The first time we were driving home from work one evening, after dark and I saw this dog running down the road ahead of us. It had a collar on and a little farther down the twisting road we came upon a truck. I thought that the dog had jumped out of the back of the truck, almost every truck in town has a dog in it’s bed, so we pulled up alongside the driver to let him know that he had lost his dog. He was not impressed with our efforts as a Samaritan and informed us that the dog was meant to be outside of the truck, getting his exercise. Mind you, it was dark and there are no streetlights along this road. I thought it was all rather strange but since that night I have seen many different dogs running behind many different vehicles along that road into the forest. Apparently the dogs need the exercise way more than the people do. I suppose I should be glad that they care enough to exercise the animals at all but I suspect it’s simply to keep them in top form for hunting or for defending their property. On the bright side, it provides hours of entertainment for our dogs as they bark vigorously at their compatriots running down the road. The people driving seem less impressed with their enthusiasm, but I say if they don’t like it they can drive down some other road. As we may have mentioned before, our daily dog walk, which is actually more of a hike, is very beneficial to our state of mind. It helps keep us in shape, which is important when you’re on your feet all day. It’s also a time to get away from work and get a bit of space to clear our heads. During the busy times, only one of us gets that benefit each day, but when we are able to walk together we use the time to brainstorm and work out dishes and deal with any situations that may be pressing. Inspirations are everywhere and sometimes a walk in the woods can be just what the doctor ordered. It’s a brief moment in time when we bounce a myriad of ideas off one another and any concept, no matter how ridiculous, is given serious consideration. 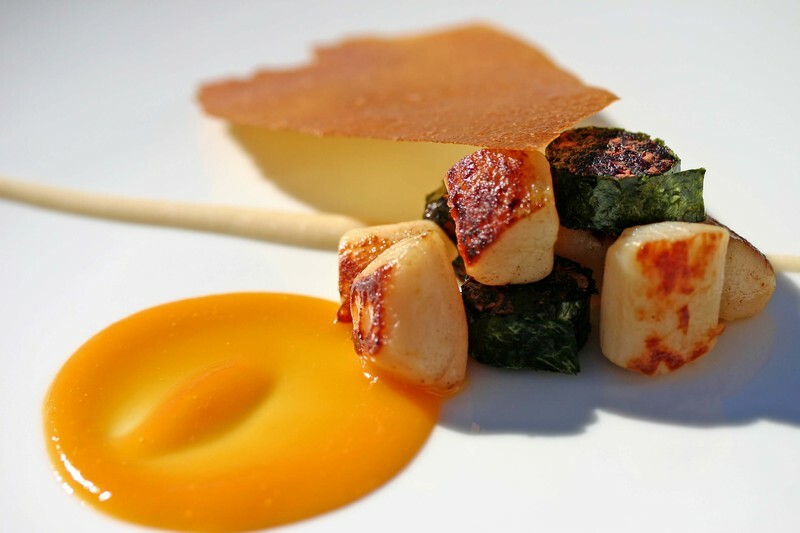 We debate textures and flavors and the actual validity of some of the dishes that we create. We may not always agree on the initial concepts but we both have to like the final products. We have very different outlooks on food and sometimes bringing them together can be challenging. On the other hand, when it all comes together it is an amazing thing for both of us. Today the walk helped refine our cornbread pudding. The pudding is served hot in the style of a creme caramel. In this dish, the caramel is maple vinegar, the pudding is cornbread and yogurt based and the topping is smoked keta salmon roe. The walk today provided the right moment to filter these ideas. Cornflakes. I was looking for an intense and semi-unique crust for our slow cooked antelope. I looked up on the shelf and saw our breakfast cereals and was drawn to the cornflakes. I pulled down the box and tasted the flakes; to be frank I have not eaten cornflakes in a long time. The toasted malt flavor of the flakes would add an important accent to slow cooked game. I simply pulverized the flakes and applied them to the leg filets of antelope. We used a spiced date puree to adhere the ground flake to the antelope. I was and still am tempted to smoke the flakes and other breakfast cereals for future applications, though that is down line. 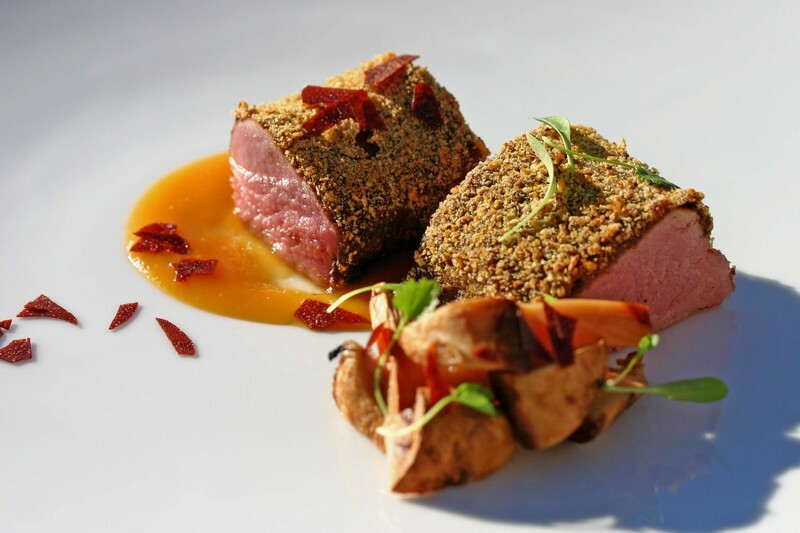 We paired the cornflake-crusted antelope with our dried mango and rose tea puree, tomato-jalapeno flakes, griddled matsutake mushrooms and young cilantro. I was looking for another seasoning for shrimp carpaccio. I had thought of bottarga, but I did not have any. I thought of grated bonito but, that seemed to assertive for ruby shrimp. What else would really make the flavors of the carpaccio pop? Chorizo. Try grating chorizo. I did, and it worked. It grated like a delicate Parmesan cheese, fine whispers of cured meat. The grated chorizo led the way and dictated the balancing flavors: celery leaf, epazote, cilantro, dried black lime, chufa nut and marinated matsutake mushrooms drizzled with manni olive oil. Yesterday we received some perfectly cured keta salmon roe from Steve Stallard of Blis caviar. The roe was fresh and fatty, a light smoke permeated the roe, it was balanced. We had to find some simple ways to allow the this roe to steal the show. When I think smoked salmon, how can you not when you eat this roe, cucumbers come to mind. They are bright and fresh and can cut through the richness of smoked salmon. Yet, we needed a way to judiciously apply the cucumber rather than in thin slices, or a nice dice. 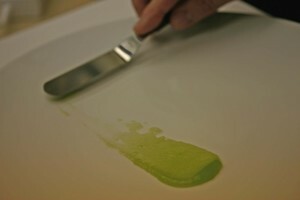 We decided to make cucumber puree. 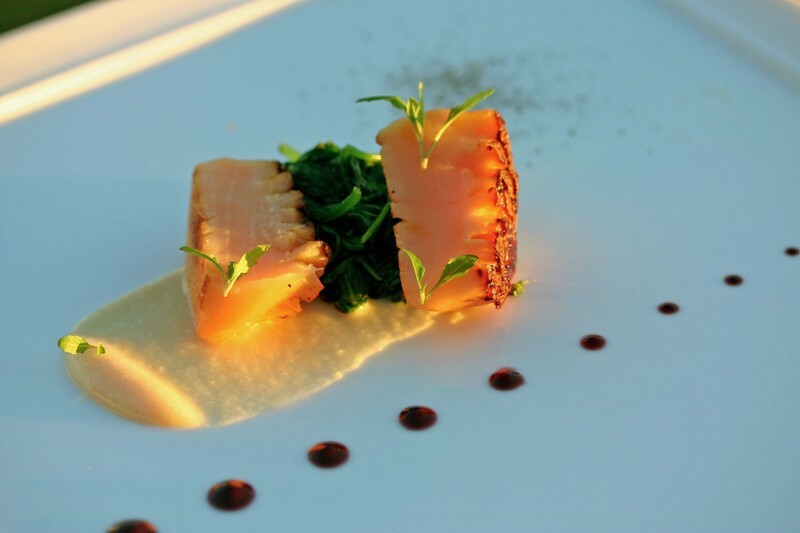 The puree retains the freshness and clarity of cucumbers, the perfect foil for the smoked roe. In its pure form we took bites of roe and puree and were tempted to serve the two simply by themselves. 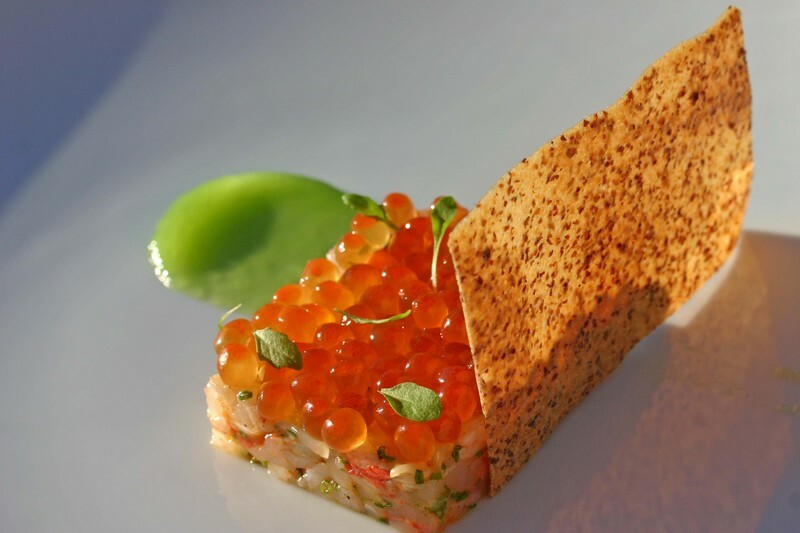 Yet, I cannot always leave well enough alone, so we put together several dishes which highlight the roe, integrates the cucumber and creates delicious bites. The first dish is a ruby shrimp tartare with manni olive oil, smoked keta roe, cucumber puree, mustard chip and epazote. 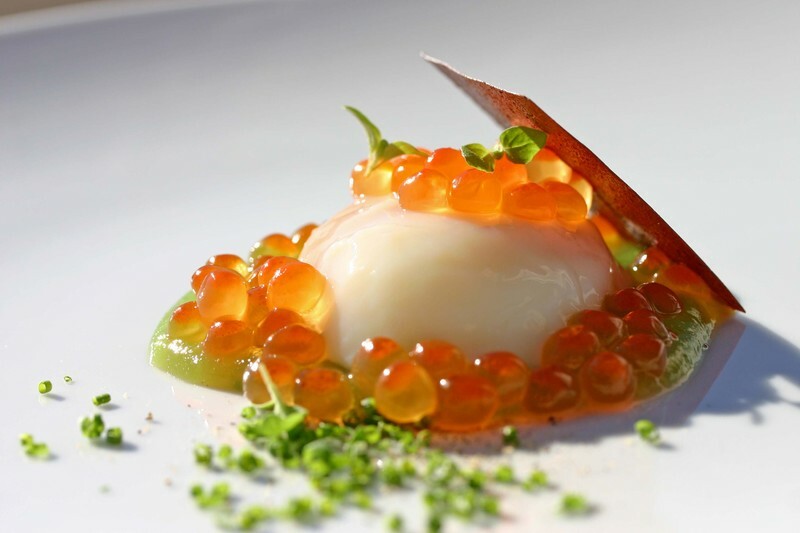 The second dish is a hot spring egg with cucumber puree, smoked roe, marjoram and chives. A walk in the woods is usually good for our dogs and even better for my ideas. I remember glasses of eggnog first being poured Thanksgiving Day and a carton remained and were replenished through New Years Day. I was also quite hungry during the walk, and thoughts of cheesy scrambled eggs and ricotta pancakes taunted my belly. And as it usually happens several factors sparked an idea. We could make scrambled eggnog. Yeah that would be neat. 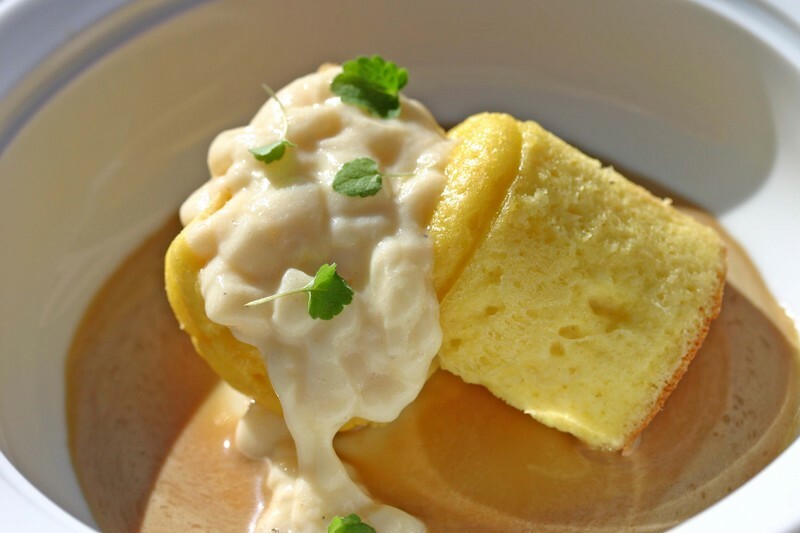 What to serve with scrambled eggnog? Well, lets play with a hungry mans breakfast: eggs, bacon, coffee, and pancakes. We did just that though reworked the dish in the style of a rum baba, soaking the warm pancake with dark rum right before serving. The sauce is espresso, bacon, maple syrup and a hot spring egg. A sprinkle of anise hyssop rounded out the flavors in the scrambled eggnog. Recent e-mails and comments have spawned questions about what tools we use to create froths and arrange the purees pictured in our photographs. These are two inexpensive tools that we use daily to help create these effects. The first is simply a baby offset spatula. The first time we used it to spread tuile batter on a sheet tray we knew that it was destined to be used for plating. Simply place a spoonful of your sauce or puree on the places and then drag the spatula through it to spread it on the plate. A damp linen napkin can be a helpful tool to clean the plate as you are mastering the process, to sharpen lines if you don't like the free-form effect, and to clean the rim of thumbprints before heading to the table. 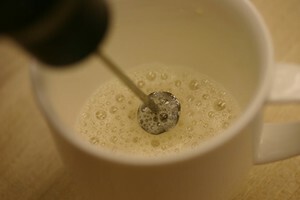 The second tool is wonderful for emulsifying both hot and cold liquids. It is the Bonjour Caffe Froth. Be careful as there are imitators that do not work, but this one is fabulous. It's battery operated, so you do not need to worry about cords, easy to clean, and easy to operate. If you want a really stable froth you can use a few granules of lecithin as a stabilizer to get your creation to the table intact. The last great benefit to this frother is that unlike an immersion blender, it can work with very small amounts of liquid. Pictured here are a few tablespoons of apple cider blended in a coffee cup. As I've touched on before, my unusual childhood household (Japanese Mom, Italian Aunt, Jewish Uncle) gave me a wonderful base for my career in food. Although we never mixed the genres,combining Japanese with Italian at a meal, there were times when there were two meals on the table simultaneously, being eaten by different people. I have drawn upon these different food cultures throughout my life. Yesterday when the temperatures finally dropped into winter and the afternoon was draped in a hard light and a piercing chill, my thoughts turned to blintzes. Blintzes were not a common occurrence at home. They were something to eat in restaurants, whether they were Jewish deli-style places or the Polish home style cafes that popped up around Forest Hills. They were a dish that I often lusted over but rarely ordered, being too close to dessert and not up to fighting the temptations of dill pickles, corned beef, latkes and kielbasa. By the time dessert rolled around I was always full. Occasionally though, someone else at the table would order them and I would be able to snag a bite. In my mind, they had to be devoured immediately while they were still piping hot and crispy around the edges. The insides would be slightly sweet and creamy with cheese and the wrapping would be chewy and pliable on the inside, crisp and dripping with butter on the golden exterior. They were usually served with a goopy fruit sauce, strawberry or blueberry which I would assiduously scrape off of my bite. Contamination was not acceptable, but straight cheese blintzes, no matter how good, could only be eaten in small quantities without something to cut through it's smooth richness. As I write this I think that a good squirt of lemon juice would have done the trick but at the time it didn't occur to me. I hated those fruit sauces, endemic with pancakes and blintzes. I never understood why waffles came with fresh fruit and everything else came with a sickly, sticky mess. So yesterday, when the weather turned bitingly my mind turned to blintzes. I think it was a combination of the weather and the oddly wonderful berries that we have been getting lately. These fruits of late fall have been richer and more fragrant than the ones seen over the summer. I had some fresh ricotta, a by product of my experiments with mozzarella, combined with creme fraiche and a pinches of sugar and salt, it made a wonderful barely sweet filling. The blintzes sizzled in my pan and were served with a salad of fresh strawberries dressed with our homemade wine vinegar and baby shiso. It was better than I remembered it. Also for those that are wondering, yesterday's mozzarella was a hundred times better than the day before. It actually did all of the things that it was supposed to do. This in spite of the fact that I had to substitute 2%milk for whole. It wasn't perfect but it was definitely mozzarella and although improvements will be made, I was happy. Whisk eggs into milk and add flour and salt. Whisk to form a cohesive batter, cover and let rest at room temperature for half an hour. Heat a nonstick pan 6" pan over a medium flame and spray with nonstick pan coating. (You will only have to spray the pan once.) Ladle an ounce of batter into the pan and swirl to coat the bottom. Let cook for twenty seconds and flip. Cook or ten seconds and remove from pan. Immediately ladle in another ounce and continue as with the first crepe. Keep making blintz wrappers until you run out of batter. Blintzes can be cooked ahead of time and assembled just before cooking. Stack them on a plate with waxed or parchment paper between the layers and wrap with plastic if you are not using them immediately. *Add a splash of lemon juice and a teaspoon of grated zest for a lemon cheese filling. Place a wrapper on your work surface, darker side up. Place two tablespoons filling in a vertical line just to the left of the widest point in the crepe. Fold over the left side and fold down the top and up the bottom. Roll like a burrito to finish and set aside, seam side down. When all of the blintzes are assembled, fry in butter over medium heat until golden brown on both sides. Serve immediately with fresh berries. I felt it only right to continue down the path of olive brine uses. Today we soaked dried wild blueberries in green olive brine to hydrate and soften. After the berries softened we pureed and strained the sauce. 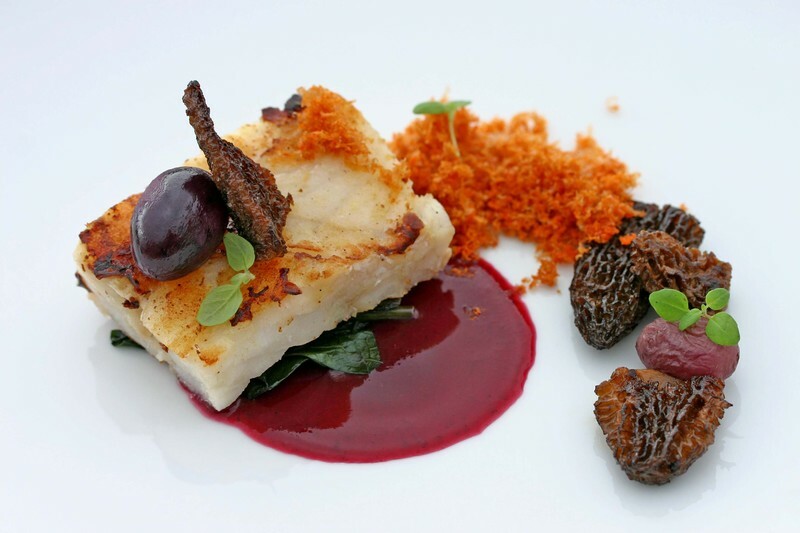 The salinity and green nature of the brine balanced the sweet tannins of the dried blueberries. Similarly, a fine use for wild blueberries is in pancakes, buttermilk to be exact, so we paired the sauce with our buttermilk-smoked maple puree and sauteed scallops. Olives on the other hand have a fine affinity for spinach, so that to made the cut. Some ground allspice added a floral note to the dish, and we were done. We made a broth with a Ti Quan Yin tea from Harney and Sons, chestnut honey and soy sauce, which we were able to serve smoked wild char roe floating in it. The tea has an earthy rich flavor and the chestnut honey and soy sauce add some sweetness and rounded salinity which accent the popping pearls of the wild char roe. 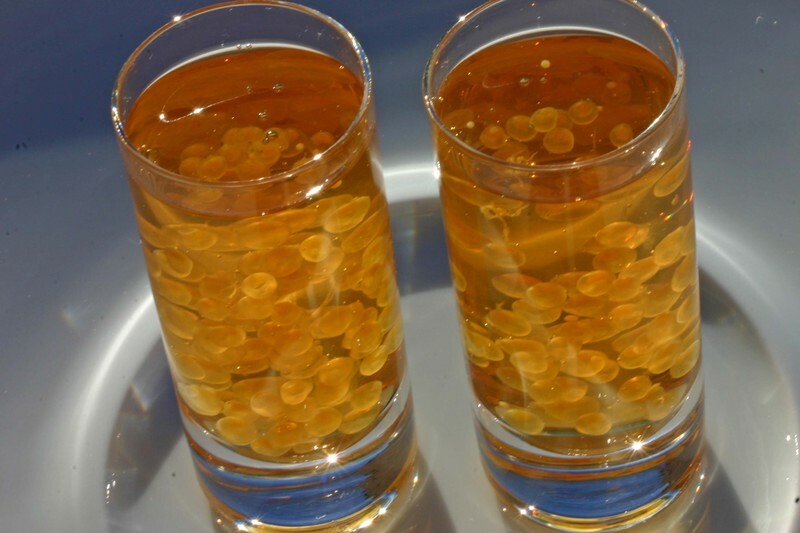 The roe floats and is distributed in the broth allowing the pearls to be enjoyed in several sips rather than one large bite. The lamb necks cooked for twenty four hours at 67 degrees C. We then pressed the necks and let them chill. When all was said and done I had nice rectangles of braised lamb neck, seasoned throughout with a reasonable amount of fat marbling. We worked out a dish today with our banana vinaigrette, ground olives, chocolate flavor herbs and vanilla soy. Chocolate flavor herbs are our combination of herbs which has flavors inherrent in chocolate and in combination present a full aromatic representation of chocolate. The vanilla soy is tamari soy sauce infused with Tahitian vanilla beans. As everyone knows, professional kitchens are busy places. We've had some experiments with cheesemaking on our list for a while and I was determined to get started today. Our big group checked out yesterday and our new arrivals would not be coming in until around noon. Plenty of time to try out a new recipe or two. Of course I didn't factor in the fact that it is a Monday, the busiest morning of the week whether or not anyone is staying with us. I got in early and skimmed over the recipe for fresh mozzarella, it seemed easy enough and like a good place to start. The recipe was quick and painless and promised great rewards. I started to assemble my ingredients. Then the phone started ringing, people started arriving, deliveries appeared and general chaos reigned. Maybe an hour or more passed before I got back to my mise en place and began making my cheese, along with a few other things, and without re-reading the recipe. Of course since I wasn't really focused I made a mistake right off the bat but I figured that I could compensate for it later. Let me tell you, in a recipe with very few steps, compensation is not always possible. So, instead of a smooth, silky, creamy mozzarella I ended up with something that looked suspiciously like cauliflower. Oddly enough enough, it had the texture of steamed cauliflower as well. Although it did have the fresh sweet tase of milk. One out of three isn't exactly what I was aiming for. I suppose it's a sign to slow down and enjoy the process. Good food should never be rushed and tomorrow morning it won't be. Every kitchen has saute pans. Well, almost every kitchen does. Diners have used griddles for cooking eggs, bacon and the like for at least my life time. From griddles we can move to the high temperature plancha of current culinary stardom. If you do not have a plancha what kind of cook are you? We have a cast iron griddle which we procurred from a garage sale. We use it for griddling english muffins for breakfast and hot dog rolls for lobster rolls. 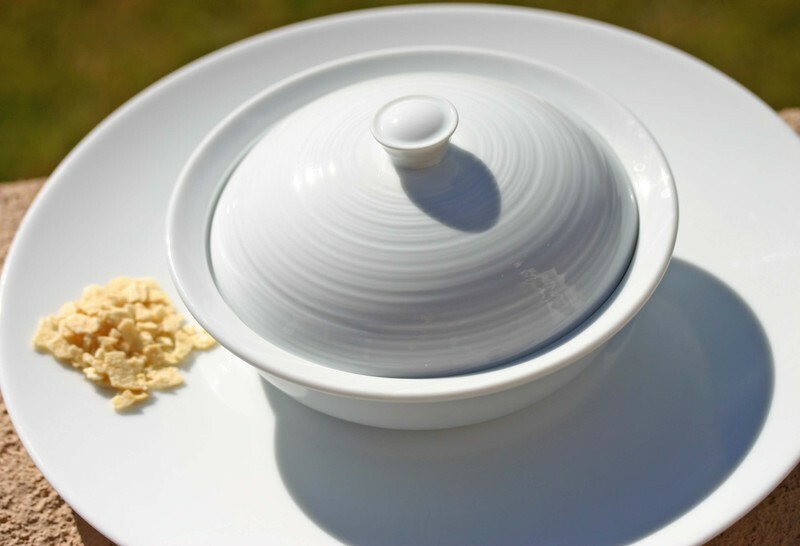 Until recently we have not used it as a cooking surface for proteins and vegetables. Why, our space is limited and it is not always functional to put into use. And yet, I have felt we were missing out on something. I hate spattering oil, so the use of a saute pan with oil or another fat in the bottom to cook ingredients has begun to leave a bad taste in my mouth. Similarly, with the continued use of slow cooking and twice cooking the need for a saute pan and its traditional uses seems less important. Now, if I were to get more technical in terms of naming pans, a saute pan would not be used for cooking these ingredients, rather a sauteuse would be called into action. In either instance, the pan limits how you cook in that there is no freedom of moving an ingredient. As with a french flat top range, the griddle allows the free movement of ingredients over varied temperaures without the confines of a single heat element. Again, as many know I thrive off of options, so the uses of the griddle, plancha and flat top resonate through my thoughts. 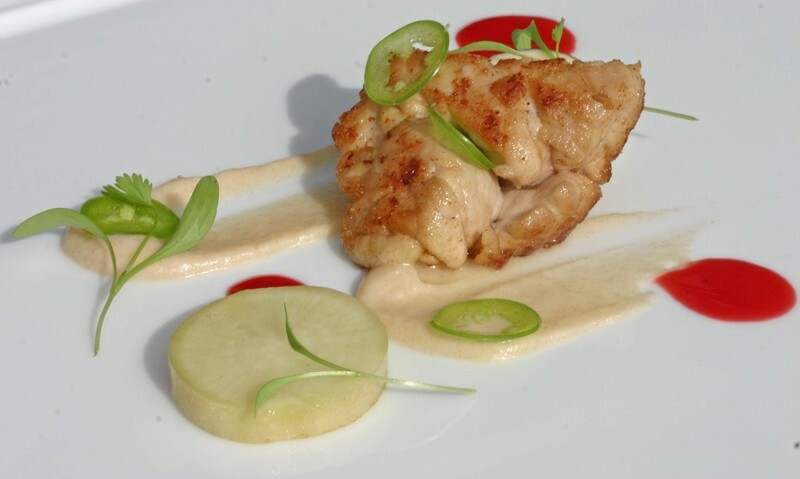 Today we cooked our sweetbreads on the griddle for a beautiful golden crust. 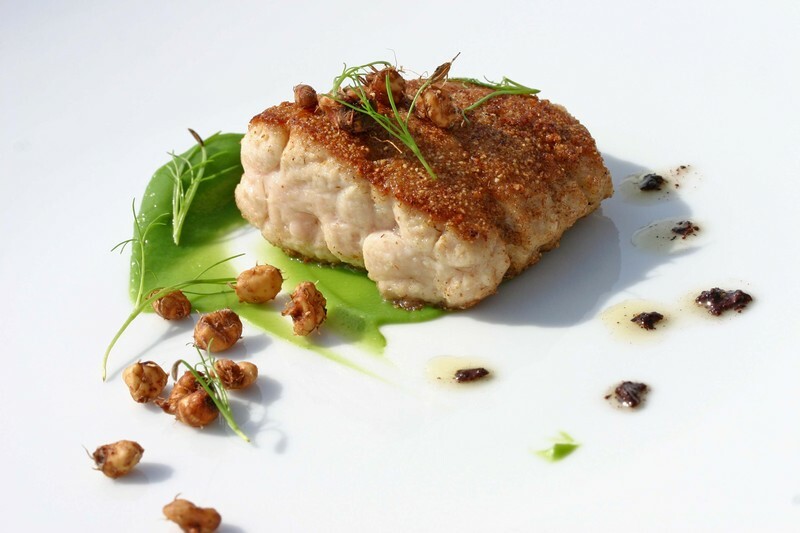 It was generated simply from the combination of heat and the fat that rendered from the sweetbreads and with limited sputtering and splattering. And so we begin down another avenue with a new set of unlimited options. Maine has been on my mind recently and Alex’s mention of Clayton Spinney shows that his is as well. Clayton was a true character and we enjoyed dealing with him on a regular basis. He was an older farmer born and bred in Maine, opinionated and crusty, generous and open-handed. His wife made a wonderful cheese that they marketed as Bovre. Clayton had a distaste for goat’s milk so his wife decided to make chevre with cow’s milk. It was a huge success and we were happy to purchase it up until they shut down their operation. Regulations had closed in on them and they were unable and unwilling to keep up with the necessary improvements to their kitchen and work areas to keep the local inspectors appeased. So they basically said to hell with it and shut down the dairy aspect of their operations. Fortunately Clayton also raised pigs. People would request them in the spring and come late fall Clayton would take them to the slaughterhouse and deliver the pig to your doorstep. He would name them after people he knew and it was somewhat disconcerting to get progress reports throughout the summer on how “Alex” was doing. Clayton didn’t discriminate though, he named one of the pigs after his daughter and it was equally strange to hear him casually discussing when he would be taking her to slaughter as well. “Alex” turned out to be a beautiful and extremely large (in my opinion) pig, and we made many wonderful things out of him. Clayton was definitely the kind of person referred to as the salt of the earth. He and his wife were very straightforward. In the beginning he was friendly but not too much so. He knocked on our door one day to inform us that we should be using his cheese and left us with a bundle of samples to play with. He never hesitated to let us know what we were doing wrong, compliments came much more slowly and with a greater sense of satisfaction. It took some time to warm him up but when we did he was full of stories and tall tales. As time went by we would get the news from all the other stops on his delivery trail. I don’t care what anybody says, men do gossip with the best of them, they just call it passing the news or shooting the breeze or some other innocuous colloquialism. The, ahem, older gentlemen are the worst. They are like little birds buzzing around, commenting on everyone and everything that crosses their path. Clayton gave us a glimpse into a culture that we never could have broken into and the stories he told us kept us entertained for hours. His wife sent us recipes and let taste her cheddar, a special cheese that she made in small batches to be given only to the people she actually approved of. On one momentous occasion they actually came to dinner with their kids, we were definitely one of the more expensive restaurants in the area, if not the most, and we were touched that for their special night out they came to us. Afterwards Clayton allowed as how the food wasn’t bad for fancy stuff. I don’t think we could have asked for a finer compliment. He was one of many small producers in the area who enriched our larder with friendship and provisions and made Maine begin to feel like home. There’s something special about New England that just can’t be found anywhere else. We both had ties to Maine from our separate childhoods, summer camps and trips to Freeport. What we didn’t know then was the number of small producers that take pride in quality products that exist there. We found those later when we were ready to appreciate them. We haven’t been back since we moved away, our time on the East Coast is so fleeting and we’re always based out of New York. We talk about it though and I’m sure that one day soon we’ll be walking along that rocky coast discovering new tastes and flavors and the people that created them. On another note, we're going to play around with cheese-making this coming week. One of the things we're planning is to try and recreate the Bovre, if it works you'll be seeing it soon. We made broccoli soup. Simple: blanched broccoli, salt, broccoli water. The base screams broccoli. We also had made some gigante beans. Cooking beans at 7300 feet is a bit of an inconvenience. We have now started cooking beans as a braise, covered in a 250 degree oven until they are tender. The beans cool in the liquid and the result is a perfectly cooked bean which had we cooked on the stove would have taken many more hours, a lot more attention and most likely would not have been cooked evenly. However, it is the turkey broth which crowns the truffle glazed beans and floats atop the soup which is really important to me. Turkey broth is an under utilized ingredient. Sure, there is turkey gravy and turkey and rice soup, but the uses of a clean and rich turkey broth in dishes is few and far between. We make our broth in a pressure cookes, a quick extraction which we then reduce in order to concentrate flavors. We use the broth for cooking beans, to make risotto, glaze sweetbreads and most recently as a light froth on top of a soup. It adds a decadence which is simple to generate and more often than not ends up in the trash as a roast turkey carcass. Oh, and if you are like us you could smoke the carcass or the broth first for another interesting element in the broth and your pantry. When we were in Maine we used to get a weekly lamb delivered by Clayton Spinney. Clayton is and has many other stories, today I am interested in the young lamb, particularly the neck. One lamb, one neck. We used to braise the neck whole and then take the meat off the bone and roll it into a cylinder. We glazed the roulade with the braising liquid and served it with young marjoram, cantal enriched potatoes and garlic flavored spinach. The neck was sold as a special for two when we had it or in some cases became my dinner. The lamb neck is, to my taste, the most decadent and under utilized piece of lamb. These days we have a new lamb supplier, Alan Higgins of Grass Roots Lamb. He has been able to supply us with lamb of all sorts from neck to belly to beautiful loins and most recently a brisket--currently a product we have not used though I for see lamb pastrami. Well, my tangents are many as i think about lamb, the product and the possibilities. What I have begun to learn over the years is in dealing with ingredients do the work now. 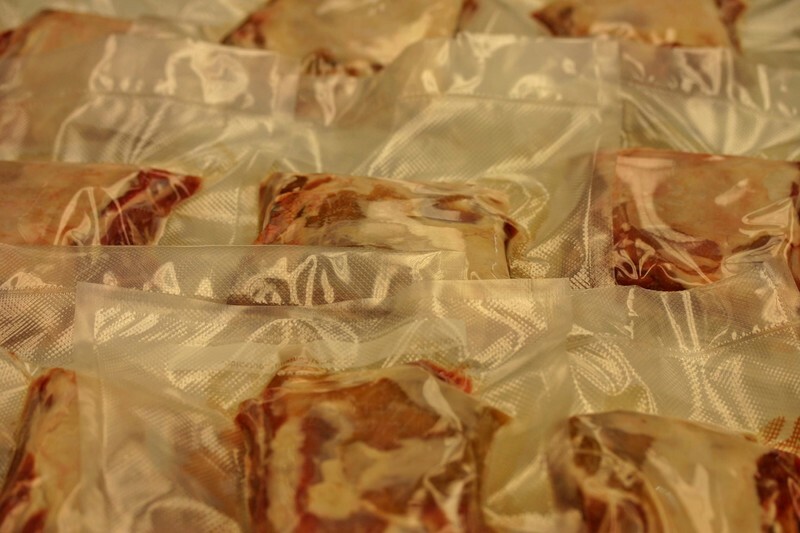 Rather than braising lamb necks whole and then unrolling them, we have taken to brining them, removing them from the bone, fusing them together, sealing them in plastic bags, slowly cooking them, pressing them and finally portioning the finished product. I think our new process has some more steps, though the end result yields an incredibly flavorful, functional and versatile product. 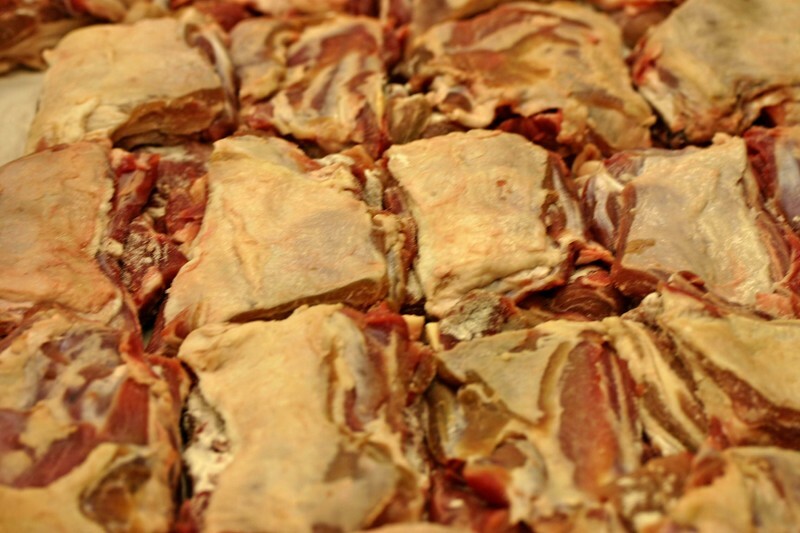 Once the lamb is prepared, we reseal them and freeze the prepared necks which we may then draw upon at anytime. The process involved upfront is now longer, though at the days end we have tremendous gains in usability and the delicious factor. My dad loves sweetbreads. I think I got my first taste of sweetbreads from him many years ago. If not, he surely put sweetbreads on my mind. Ironically enough today is his birthday and we are working on several new dishes with sweetbreads. We began by soaking the sweetbreads in salted water, then we blanched them in vinegar water, slow cooked them sous vide at 67 degrees C for an hour, pressed them and finally pan roasted them for our dishes. It seems like a fair amount of work for a single ingredient, yet each step helps focus, clarify and refine the final product. It is essential for me to fine ingredients. Otherwise, what is the point of all the work and effort? Soup is about balance. Because of this simple fact many soups can turn out lacking. That is due mainly to the lack of balance in the soup. Sweet and sour, salty and bitter, creamy and crunchy must all intermingle to create a harmonious whole. The key for me is taking away what is not necessary such that the base flavors strike chords and the supporting ingredients give the dish structure and a level integrtity. Pears and parsnips, both cornerstones of fall, proved to be an incredible canvas for our chestnut-burnt sugar gnocchi. The parsnips earthiness is piqued by the heady aroma of ripe pears. The chestnut gnocchi add bitterness and a sense of umami while the shiso provides bright herbal tones and notes of aromatic spices. Alcohol has become something so taboo in our society that I hesitated before writing this. It's on every medical form these days. Right underneath the question "Do you smoke?" is a question about whether or not you consume alcohol. If the answer is yes, you are further asked how many drinks you normally consume in a week. It's one of those sticky moments when even the most virtuous of us are tempted to lie. Just as there are many smokers who check the non-smoking box there are those of us who indulge in the occasional beer or cocktail and who enjoy a nice glass of wine with dinner who sit there frozen in the headlights, pen in hand, wondering how many drinks they should admit to. What exactly is an acceptable number of drinks per week? The very presence of the question indicates that alcohol is a negative. Prohibition may have ended, but public censorship of our actions remains alive and well. In a kinder, gentler time, the cocktail hour was a daily indulgence and it still is in some parts of society. It is that time period at the end of the work day and before dinner when people come together to relax and enjoy one another's company. The slow savoring of an alcoholic beverage is part of the process. The slight sting against your tongue reminds you to sip slowly and is generally accompanied by a gentle loosening of the shoulder muscles as the tensions and petty grievances of your day slowly slip away. Of course there are those who overindulge and have three or four stiff drinks in the time generally needed for just one. But there are also those unable to pass up a buffet table or a shoe sale or a tantalizing bit of gossip. People who dabble in excess will always exist, they seem to be the reason that many of society's restrictions and taboos are created. Responsible indulgence is another thing entirely and I see no reason why I should be penalized for a neighbor's inability to know when to stop. Let's move back to the cocktail hour. In the summertime I tend toward gimlets, usually vodka and on the rocks. In my younger days I enjoyed them in a martini glass straight up but now I appreciate the chill of the ice as well as the slow dilution that melting brings over the trendy beauty of strong spirits in a V-shaped glass. Tonight with the weather turning colder I reached for the gin. I rummaged in the fridge and found some lemon citrus olives and crafted a sharp, slightly salty, dirty martini. It was a drink that I scoffed at in my youth, dilute high quality spirits with olive brine? But again, age has had a mellowing effect and I enjoy the interplay of the soft and slightly herbal notes of a good gin with the fruity saline effects of the olive brine. The olives (3) in my glass could masquerade as a vegetable, bar snack and drink rolled into one. The slow shifting of the ice tinkles in the glass with a mellowing effect on my psyche. The sun has sunk below the horizon and the mountain landscape is outlined in deep shades of blue. With the dogs at my feet and my husband at my side the cocktail hour tonight is everything that it was meant to be and more. Fill a short (rocks) glass with ice cubes. Pour the gin over the ice, follow with the brine. Drop three olives into your cocktail and swirl the glass several times in your hands. Sip slowly and enjoy. Simple does not mean easy, though it can be. I am constantly trying, tasting and combining ingredients and more. Somethings work, many get filed. The days when dishes work is when simple rules. Today I walked a fine line and we were able to fine tune several dishes. One dish which is an extrapolation of an old condiment influenced by my current fetish with all things olive is an Axis Venison tartare. We get some incredible meats from Broken Arrow Ranch. They supply our Axis Venison, Sikah Deer, Antelope and Wild Boar. What is great about the meat? It is really simple, the meat is handled with care from start to finish. It is up to us to continue the process. Today I believe we did alright. The days are short, the nights are long and the chill in the air continues to sharpen its razors edge. Apples are plenty and the New England partner to a great apple cheddar. When the two are woven together and accented with bacon a happy Utah style marriage takes place. Throw the whole lot in hot fat and you have a reason to want Fall and Winter to last. Whisk together flour, baking powder and salt in a medium sized bowl. In a separate bowl whisk together egg and milk and pour over dry ingredients. Stir to combine completely. Add applesauce and stir to blend. Fold in bacon, cheddar, apple and onion and till thoroughly combined. Add peanut or canola oil to a medium sized pot and fill to a depth of three inches. Heat oil to 370ºF. Add batter to the oil by the tablespoonful and fry between 355ºF and 365ºF turning occasionally until the fritters are a deep golden brown, approximately 4-6 minutes. Remove from pan and drain on paper towels. Serve hot with horseradish sour cream on the side. I have not been able to get olives off the mind. Today I went through the bar refrigerator looking for martini olives. We use big fat green olives in a lemon and vinegar brine. Perfect. I had been wanting to do a play off an oyster pan roast with bay scallops and now I had a begining. I made a broth with the olive brine and apple cider enriched with butter. I diced a few green olives and added them to the broth. I set the broth over a low heat and then added the scallops to poach gently. When the scallops were cooked, the flavors were married. A simple pan roast with minimal heat, tons of flavor and just a few ingredients. I added some fresh oregano and espelette pepper to round out the soup. Surprise is good. Well, calculated surprise is good. That is why I am fond of covered dishes and liquid filled foods. You are expecting one thing, and the element of surprise is that one is not quite sure what they are going to get. It brings life to a dish, it allows for a ta da moment at the table. 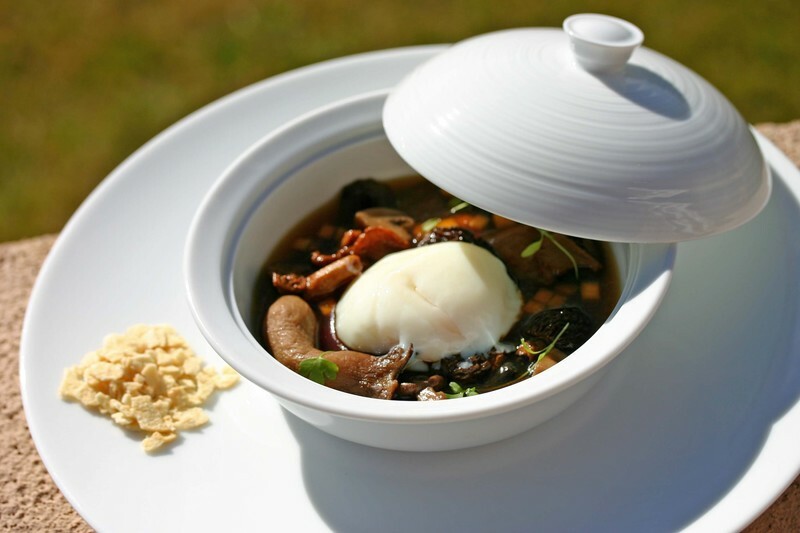 Today we were able to use a new dish from Bernardaud to highlight the key element of a dish. 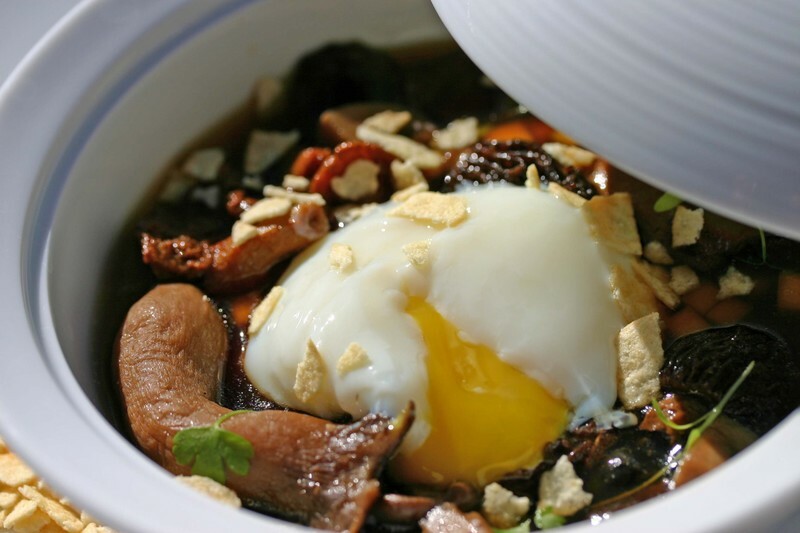 A hot spring egg is hidden and when it is revealed, the egg is still in a hot spring, though in this case the egg rests comfortably in a mushroom stew. What to do with over-ripe bananas? Well, their heady sweet aroma permeated the kitchen and seemed to call for balance. I smashed the bananas with banyuls vinegar and some salt and then let them sit in my cooler overnight. This morning I came in to the smell of bacon with the marinated bananas on my mind. I pureed the banana mixture and emulsified it with the hot bacon fat, the bacon itself had another use. The result was a creamy, sweet, salty, sour and smoky vinaigrette. We still had some bay scallops and this vinaigrette seemed a unique counterpoint to their sweet salinity. Because we were exploring flavors today, I ventured further into our larder and put together a dried mango and rose tea puree as well as a roulade of dried blueberries, cocoa nibs and nori. The assemblage of these ingredients brought together an interesting dish of dried fruits, nuts, land and sea. It began with the banana and ended with the dish. Pan sauces are great, simple and full flavored, easy and practical. Similarly, pan vinaigrettes prompt inspiration and adaptation as a dish is finally assembled. Over the years, I have become enamored with a simple pan vinaigrette of brown butter and balsamic vinegar. We use it to dress ramp ravioli as well as braised monkfish. The flavors balance each other and may be adjusted to the ingredients on hand. Consequently, I have spent a fair amount of time trying to fine tune and polish what began as a simple basic spur of the moment sauce. I also wanted to have a consistent product which could be easily drawn upon at a moments notice. I truly enjoy the idea of pan sauces and vinaigrettes, but I needed to have one which is mess free during the moment of service. Thus I began my development of a balsamic-browm butter puree. I balanced the sweetness of the balsamic with some sherry vinegar and added salinity with soy sauce. Now I can add and place the exact amount of "pan vinaigrette" where I want. 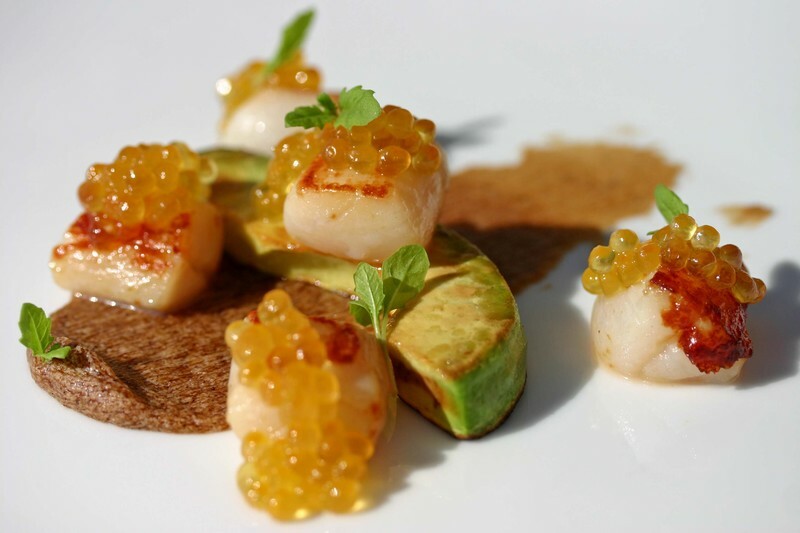 Today I was able to apply it to a dish of sauteed scallops and avocado with epazote and wild char roe. We get a lot of questions about how we create some of the more unusual dishes in our kitchen. The theory behind mozzarella gnocchi and warm foie gras terrine can be confusing unless you know about some of our secret ingredients. The tools we use to create some of these specialties are known as food gums. The term food gums sounds more ominous than the reality, in fact, most people have food gums in their kitchens. Cornstarch and gelatin are common examples of a food gum. These ingredients are used to change the texture and composition of different foods. Less common food gums which are often at work behind the scenes in restaurant kitchens are three that we use on a regular basis, carrageenan, methyl cellulose and hydroxypropyl methyl cellulose. For the purposes of simplicity I will group the last two together under the heading of methyl cellulose in this explanation. 1) They are used to thicken products, such as the filling in a pie. 2) They are used to emulsify products, for example a sauce or a vinaigrette. 3) They are used to change textures, in food products that usually translates into a thicker or chewier texture. 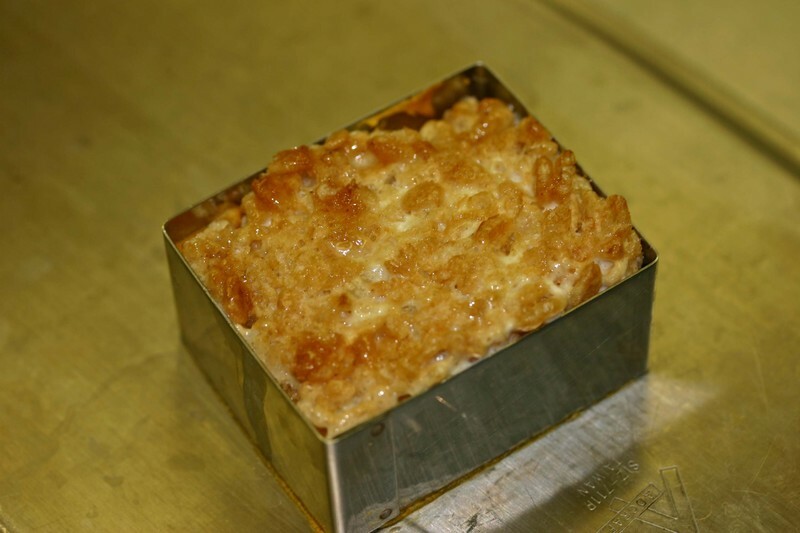 4) They are used to stabilize crystals such as ice in a frozen product of sugar in a caramel. Carrageenan is a obtained from the red seaweed family. There are three different types of Carrageenan, kappa carrageenan, iota carrageenan and lambda carrageenan. They each have different gelling properties and can be blended for use in different applications. Carrageenan’s most important characteristic for food preparation is the ability form different gels at room temperature from soft to firm. Once a gel is formed using carrageenan it is very stable and can be taken through a range of temperatures with no visible breakdown of the gel. In other countries it is often used to create puddings and other sweet desserts, an application that we have also applied in our kitchen. Methyl cellulose is used to create what is known as a thermoreversible gel. The methyl cellulose hydrates in cold water, after which it is added to your food product and thoroughly dispersed. Like the carrageenan, methyl cellulose comes in different formulations that can be tailored to the desired final effects. Once you have the methyl cellulose thoroughly incorporated into your product it will gel when heated. 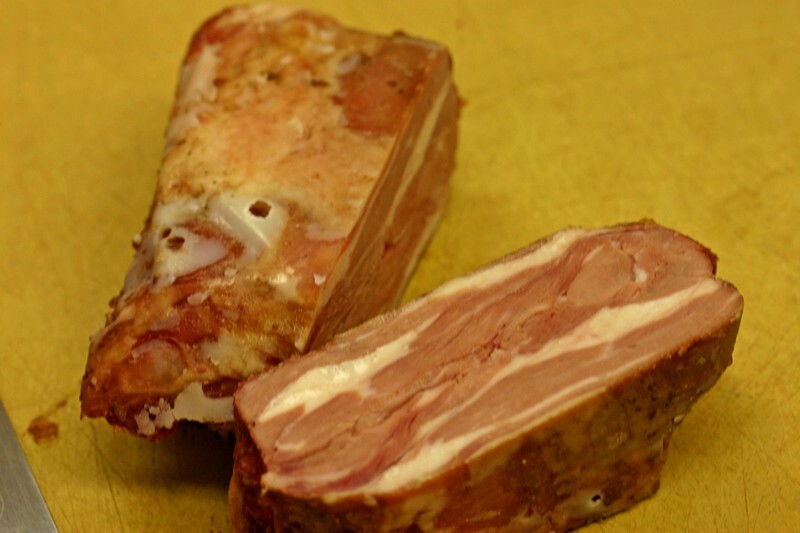 For example, when we created our warm foie gras terrine, we de-veined the foie gras, incorporated the methyl cellulose, formed the individual terrines and then seared them. 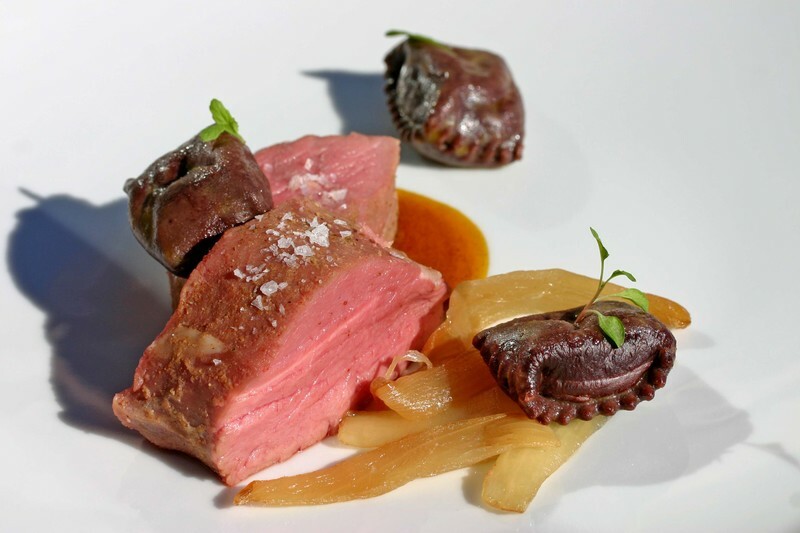 By using this product, we were able to create a dish that had all of the positive aspects of a terrine while still retaining the warmth and the texture of seared foie. These are just a couple of the ways that we have utilized food gums in our cooking. Hopefully, this bit of background information will help people understand what they are and why chefs use them in their kitchens. We tried to keep this first post relatively simple, but feel free to contact us with any questions and we will expand upon this information as time goes by. *This post has been edited to reflect standard terms for methyl cellulose instead of proprietary names. 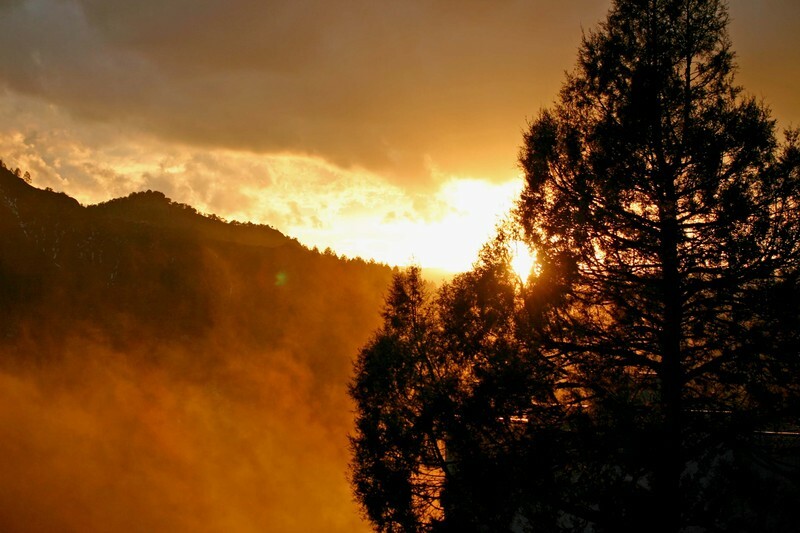 As the weather turns colder, outdoor fires become less and less popular. Similarly, the lure and fantasy of hot melting s'mores seems to increase. Sure we could have an indoor fire with people making s'mores, thought big metal fire fence is a bit of an obstacle. 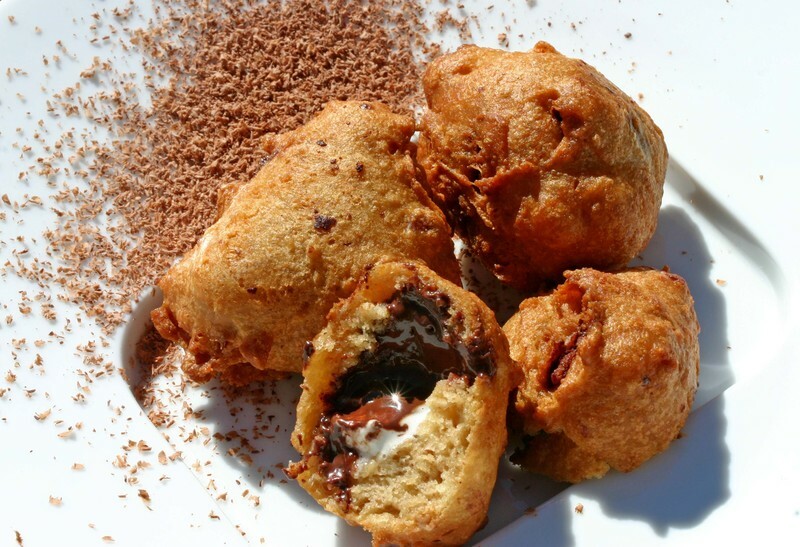 So, during our fritter bonanza we worked on deep fried s'mores. Sure, there is no wood smoke smell (I could fix that quite easily with smoked chocolate, marshmallow or graham cracker) but the molten marshmallow and chocolate chips in the graham cracker batter make for a great campfire substitute. Whisk together flour, graham cracker crumbs, baking powder, and salt in a medium sized bowl. In a separate bowl whisk together egg and milk and pour over dry ingredients. Stir to combine completely. Add peanut butter and stir to blend. Fold in chocolate chips and marshmallows till thoroughly combined. Add peanut or canola oil to a medium sized pot and fill to a depth of three inches. Heat oil to 370ºF. Add batter to the oil by the tablespoonful and fry between 355ºF and 365ºF turning occasionally until the fritters are a deep golden brown, approximately 4-6 minutes. Remove from pan and drain on paper towels. Dust with powdered sugar and cocoa and serve hot. I learned something about views. I was informed that they are best when partially obscured. That means if the view is more than partially obscured you better find a way to fix it or get a better view. Low and behold, I was taught through the act of doing how to fix a view. 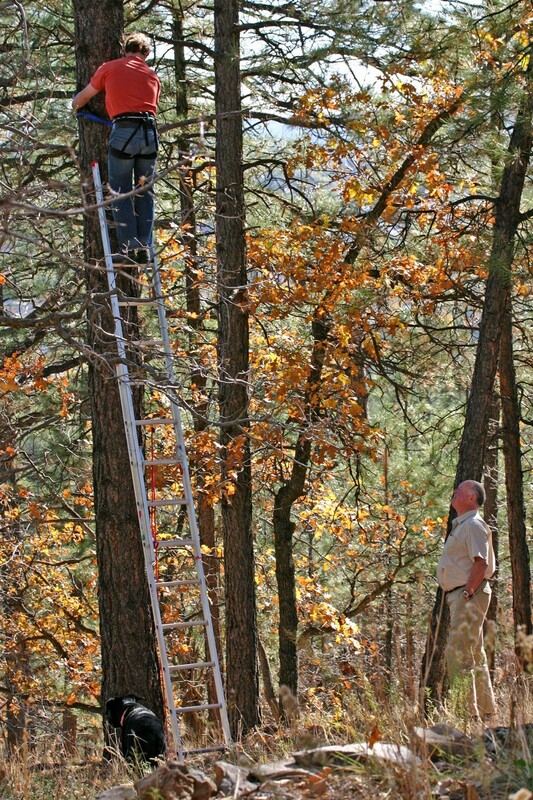 Climb a tall ladder with a saw and then use climbing gear to scurry further up the tree in order to cut and remove the dreadful view obscuring branches out of the way. Yes, this lesson was like many I have learned, knee and knuckle scraping but plenty useful in the end. In fact, it got me thinking more about a culinary aesthetic and what stays and goes on a plate. See the process for yourself. 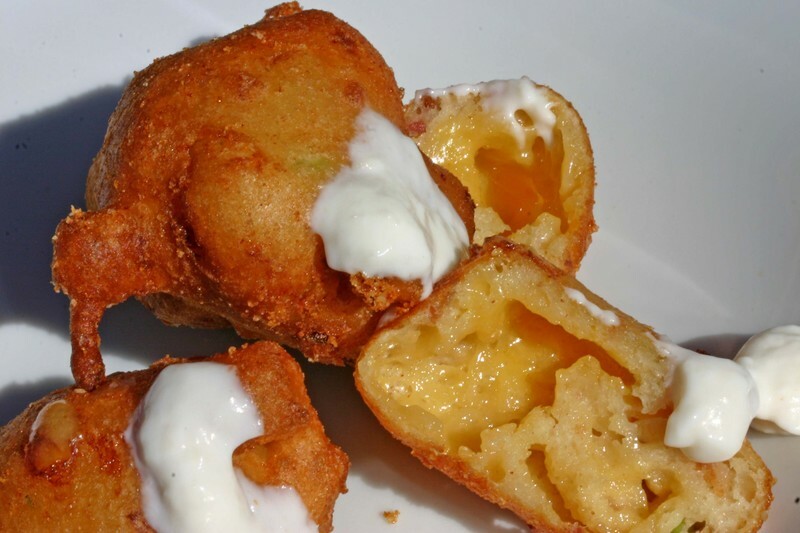 We have gotten side tracked and not been as diligent about following up with our fritter fiesta. One fritter which was tasty and equally funky is our crawfish fritter. The twist was in placing the fritter batter on sheets of nori and then dropping them in the oil. They turned into fritter tacos, well sort of. 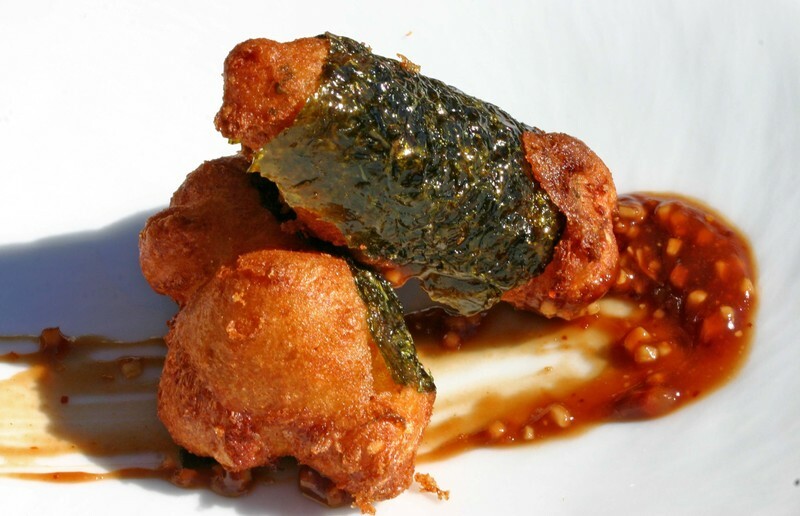 Here is our Asian spiced Crawfish-Nori Fritter. Whisk together flours, baking powder, salt, sesame seeds, togarishi and garlic powder in a medium sized bowl. In a separate bowl whisk together egg, milk, sesame oil, hoisin sauce and miso and pour over dry ingredients. Stir to combine completely. Add fromage blanc and stir to blend. Fold in crawfish tails till thoroughly combined. Add peanut or canola oil to a medium sized pot and fill to a depth of three inches. Heat oil to 370ºF. Spoon a tablespoon of batter onto a square of nori, slide into the oil and fry between 355ºF and 365ºF turning occasionally until the fritters are a deep golden brown, approximately 4-6 minutes. Remove from pan and drain on paper towels. Serve hot with garlic chili sauce. I have not always been much of an oatmeal guy; I mean its oatmeal right. I did have one great bowl of oatmeal years ago when looking at colleges. The key to that oatmeal was the warm walnut cream poured over the top and mixed in for a swirled luxurious effect. Well, we made some dried fruit oatmeal the other morning for some guests. Scottish and rolled oats were cooked together with dried fruits to make a two-textured oatmeal. (In the future we plan to add Irish oats as well to add another dimension to the oatmeal) The oatmeal was creamy, earthy and fruity. I thought perfect for some Antelope we were working with. I took the oatmeal base and added olive oil and pitted olives to add a background grassy bitterness. I also added green onions and anise hyssop for herbal notes to oatmeal. I could not have been happier with olive and dried fruit oatmeal. Many times we just get lucky. 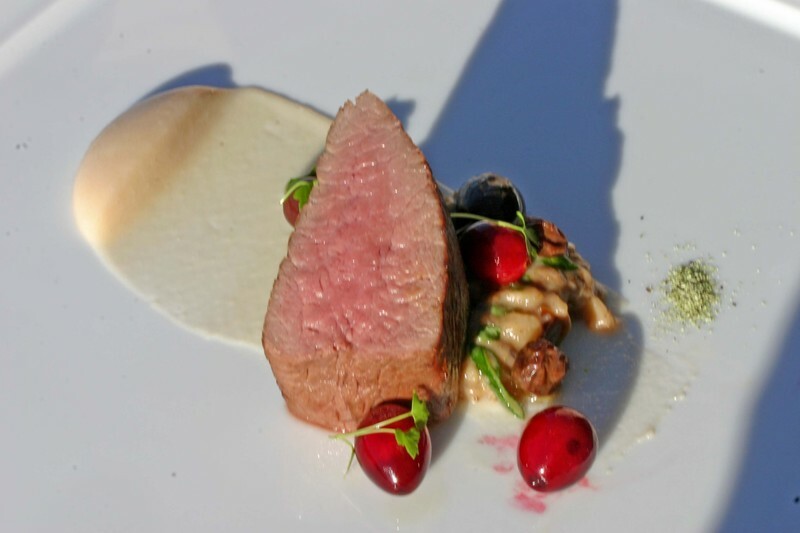 We served the olive oatmeal with slow cooked olive brined antelope, buttermilk-smoked maple puree, cranberry olives and celery.